Joseph Henry Gowan (Not confirmed parent. Appears to be based on another person’s research, but the sources of that research have not been uncovered, so no confirmation yet). David Crawford Harris Gowan born Sept. 4, 1821 – m. to Priscilla H. “Penny” Fuller (Not listed on Family Bible in 1812 pension app)(Pension app shows a Crawford Hamilton Gowan b. Aug 25, 1833). 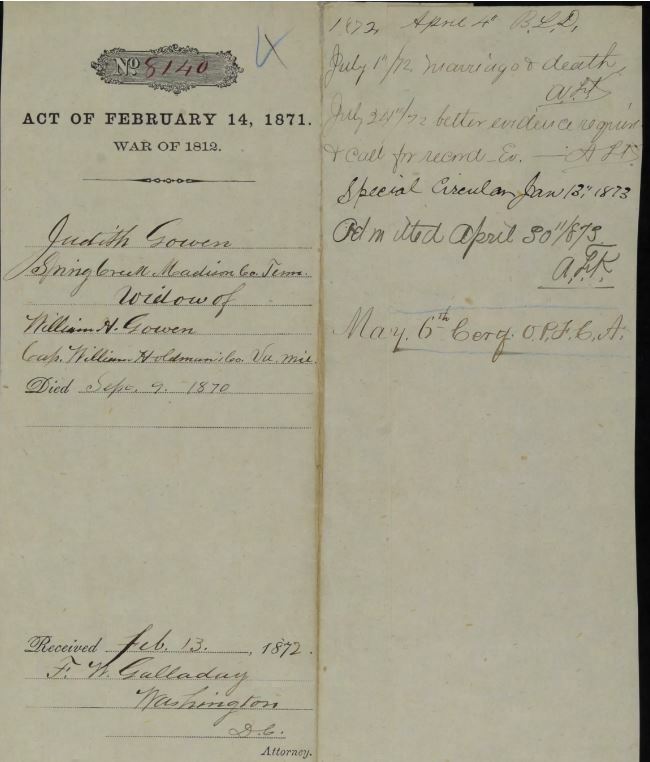 (The following selected page from Fold3’s War of 1812 Pension Applications shows the family bible that was filed by widow Judith Harris Atkisson Gowan showing their wedding date, birth date of William H. Gowan, and their children and their dates of birth: https://www.fold3.com/image/1/313423600 ). 1810 Jan 19 – William Gowen assignee of Patton Anderson, by virtue of warrant no 394 for 5000 acres, enters 40 acres of land in Lincoln Co, TN in 2nd District on E fork of Mulberry, on a north creek of Elk River, on line of heirs of James Shivers for 274 acres, including Gowin’s own improvements. Lincoln Co, TN. (Note: This appears to be too early for our William H. Gowan to be the same person – but this is the county where he ends up – so worth looking at this in case he is a little older than was reported, and in case he and his family was already living in TN but just moved to Goochland Co, Va during the war of 1812). 1810 Feb 20 – Survey for William Gowin assignee of Malcom Gilchrist by virtue of part of Warrant No 44 for 553 acres enters 40 acres of land in Lincoln Co, on head waters of the east fork of Mulberry a north creek of Elk River. Adj land of heirs of James Shivers for 274 acres . . . including Gowin’s improvement. Lincoln Co, TN. (Note: This appears to be too early for our William H. Gowan to be the same person – but this is the county where he ends up – so worth looking at this in case he is a little older than was reported, and in case he and his family was already living in TN but just moved to Goochland Co, Va during the war of 1812). http://www.freeafricanamericans.com/virginiatax.htm (This appears to be the William H. Gowan of this page). Marriage to Judith H. Atkinson on Dec 17, 1812. Discharged: Feb 19, 1815 at Camp Carter Virginia. 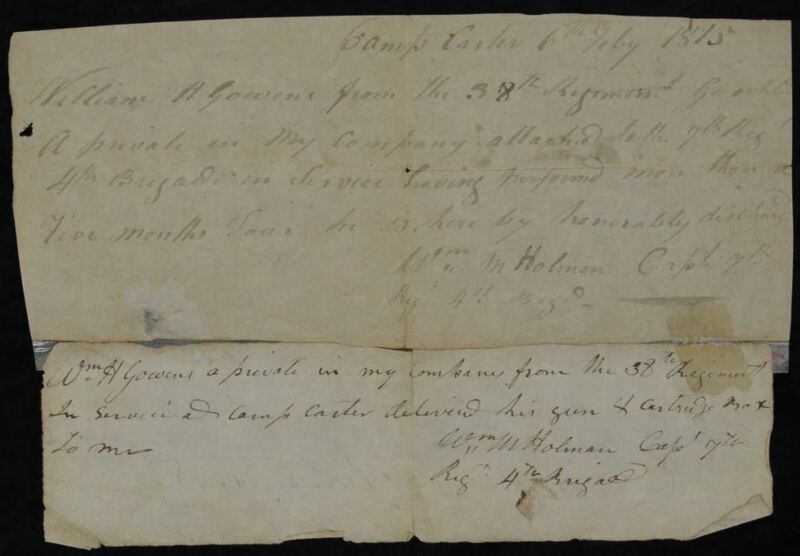 Soldiers discharge ctf and receipt for gun etc, dated Feb 6, 1815 filed in the brief. Application made Jan 11, 1851 for bounty land. Living in Madison Co, TN at the time. Was drafted at the Goochland County, Courthouse on Aug 28, 1814. Discharged at Camp Carter on Feb 6, 1815. Application made Nov 10, 1855 for bounty land. Jan 17, 1871 Judith H. Atkinson is 87 years old. Marriage date: Dec 17, 1812 – Goochland Co, Va – Reuben Ford did marriage ceremony per widows application. 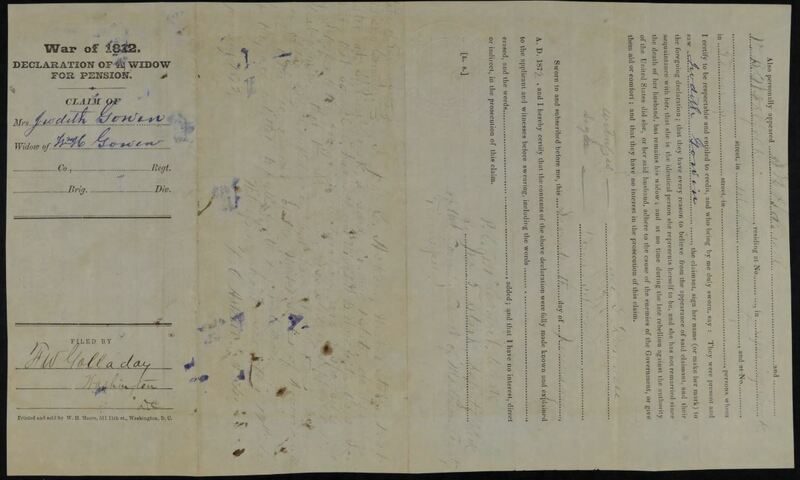 (Click Images below to enlarge – Select pages from Fold3’s War of 1812 Pension Applications – including widow’s application: https://www.fold3.com/image/1/313423600 ). 1813 Feb 5 – James Gowen assignee of Edward Goore enteres 14 acres of land by virtue of a certificate No 521 for 251 acres situated in Lincoln Co, TN on the waters of the east fork of Mulberry on corner of Matthew Price. Lincoln Co, TN. 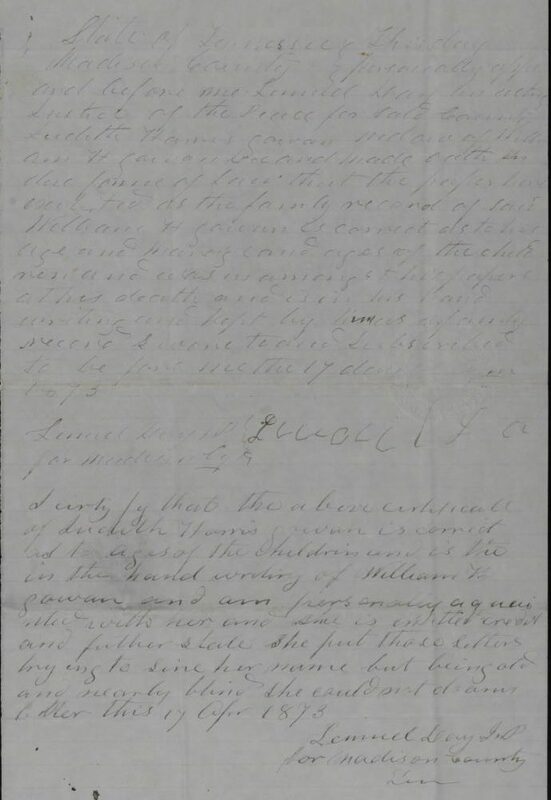 (Note: Not sure if there is a relationship here – but this “Gowen/Gowan” was living in Lincoln Co, TN when William H. Gowan arrived – so there may be a relation). 1814 July 6 – James Gowan of Lincoln Co, TN from Mathew Price of Lincoln Co, TN, $25 paid by James Gowen, recd a tract of land in Lincoln Co, TN on the east fork of Mulberry Creek, a north branch of Elk River, containing 24 and 1/2 acres granted to Matthew Price by warrant No. 938 on Dec 19, 1803. Entered March 14, 1810 by No 2237. Signed: Matthew Price. Wits: J Floyd, George Price, Alexander Norman. Proved up on Aug 1, 1814. Registered on Oct 17, 1814. vol C-1, p 109. Lincoln Co, TN. 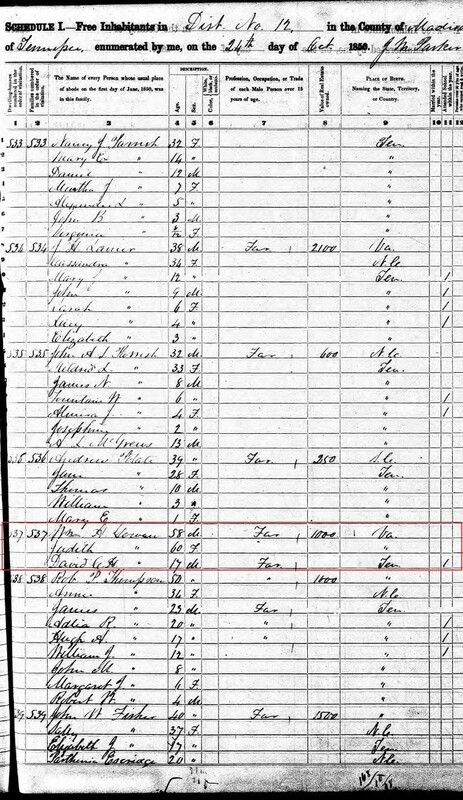 https://www.familysearch.org/ark:/61903/3:1:3Q9M-CSKX-VFBN?i=552&cat=203490 (Note: Not sure if there is a relationship here – but this “Gowen/Gowan” was living in Lincoln Co, TN when William H. Gowan arrived – so there may be a relation). 1814 Dec 17 – James Gowen recd grant as assignee of John B Hogg for 10 acres of land for certificate No 1937 for 400 acres in Lincoln Co, Tn on waters of East prong of Mulberry Creek of Elk River on NW corner of Matthew Price. Lincoln Co, TN. (Note: Not sure if there is a relationship here – but this “Gowen/Gowan” was living in Lincoln Co, TN when William H. Gowan arrived – so there may be a relation). 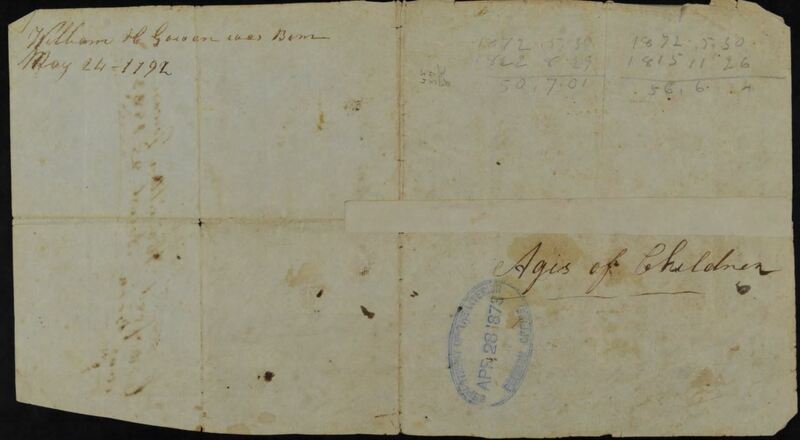 1815 Sept 6 – James Gowin recd 24 and 1/2 acres as assignee of George M Deaderick, certificate no 521 Jan 27, 1812. Land in Lincoln Co, TN in 2nd Dist on waters of East fork of Mulberry Cr of Elk River bounded by Matthew Price. Lincoln Co, TN. 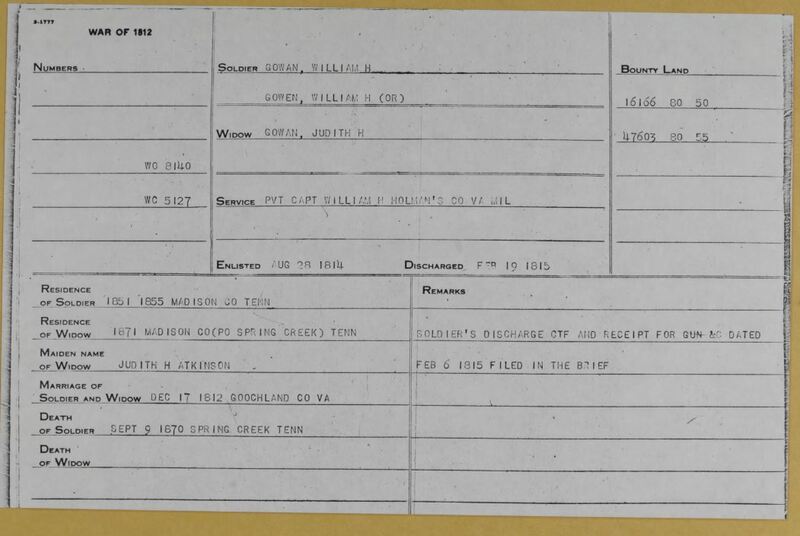 (Note: Not sure if there is a relationship here – but this “Gowen/Gowan” was living in Lincoln Co, TN when William H. Gowan arrived – so there may be a relation). 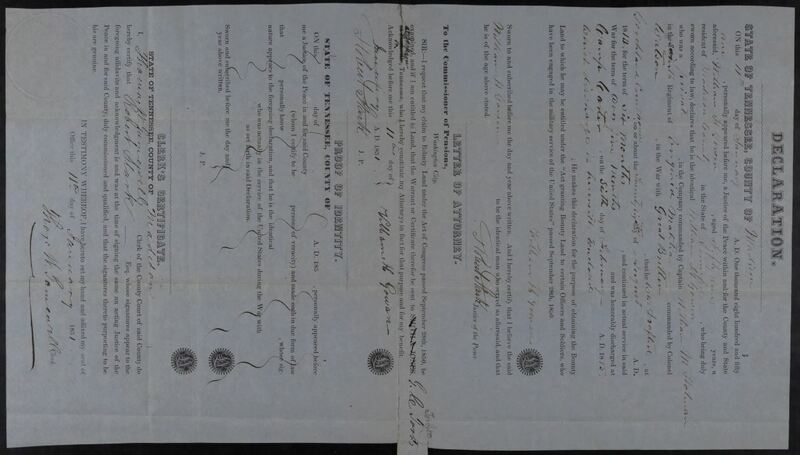 1817 April 29 – Thomas Blyth assigne of William Ray by virtue of cert no 3148 for 150 acres enters 25 acres of land in Lincoln Co, TN on headwaters of East Fork of Mulberry Cr, on the N branch of survey where William Gowan now lives, Thomas Blythe Senior, Lincoln Co, TN. (Note: The William Gowan of Mulberry Creek does not appear to be the same as William H. Gowan of Bradshaw Creek). 1817 May 1 – Thomas Blyth recd land by virtue of cert no 3148 for 150 acres, enters 25 acres in Lincoln Co, TN on headwaters of E fork of Mulberry Cr, on N branch . . . adj to where William Gowan now lives. Lincoln Co, TN (Note: The William Gowan of Mulberry Creek does not appear to be the same as William H. Gowan of Bradshaw Creek). 1818 Oct 19 – William Gowen of Lincoln Co, TN to Thomas Blythe Jr of Lincoln Co, TN, for $325 paid by Thomas Blythe Jr to William Gowen, conveys land in the second district on the head waters of the East Fork of Mulberry Creek a north branch of Elk River and bounded by land of the heirs of Joseph Shivers, containing 40 acres granted by the State of Tennessee to William Gowen by cert. No. 44, dated Feb 19, 1810 and entered on Feb 20, 1810 by No 2182. Signed: William Gowen. Wits: J. Floyd, Thos Rountree, Jno Price. Proved up on April 19, 1819. Registered on June 2, 1819. vol. E, pg. 392-393. Lincoln Co, TN. 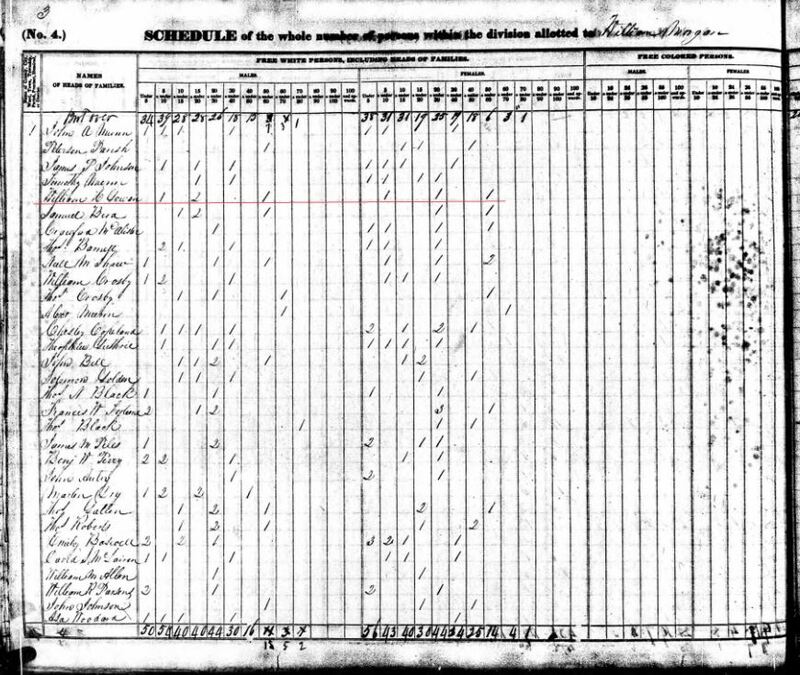 https://www.familysearch.org/ark:/61903/3:1:3Q9M-CS4Y-L93Z-C?i=510&cat=203490 (Note: The William Gowan of Mulberry Creek does not appear to be the same as William H. Gowan of Bradshaw Creek). 1840 Dec 17 – Richard M. Gowan from James Ledbetter, 57 acres on Cain Creek in Madison Co, TN. bk 7, pg 285. 1851 July 1 – William H. Gowen received Grant No. 12125 for 18.5 acres in Carroll County, Tennessee which adjoins Henderson County on the north on July 1, 1851 from the State of Tennessee. 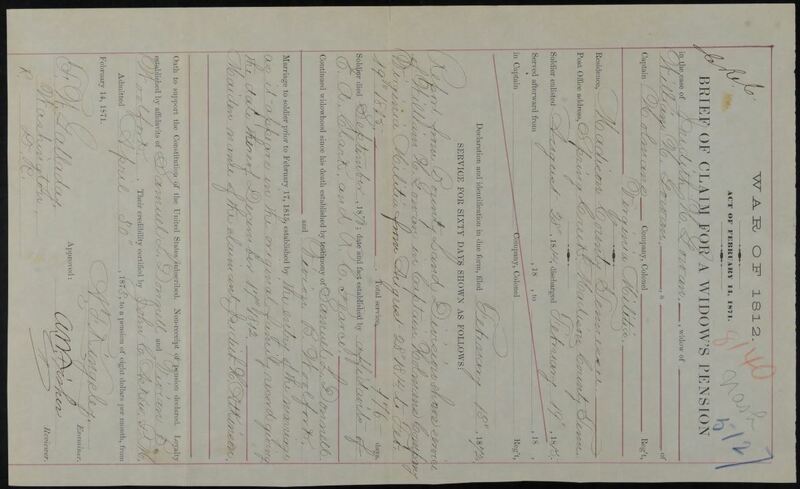 “Tennessee Probate Court Books, 1795-1927,” images, FamilySearch (https://familysearch.org/ark:/61903/3:1:S7WF-ST3C-W9?cc=1909088&wc=M6QQ-ZNL%3A179638201%2C179810001 : 22 May 2014), Carroll > Inventories, 1867-1877, Vol. C > image 339 of 399; county courthouses, Tennessee. 1878 Feb 7 – W H Gowan admr of the Estate of Judith H Gowan decd. (Note: likely this is WG Gowan, possibly a transcription error, as W H Gowan had died by this time). 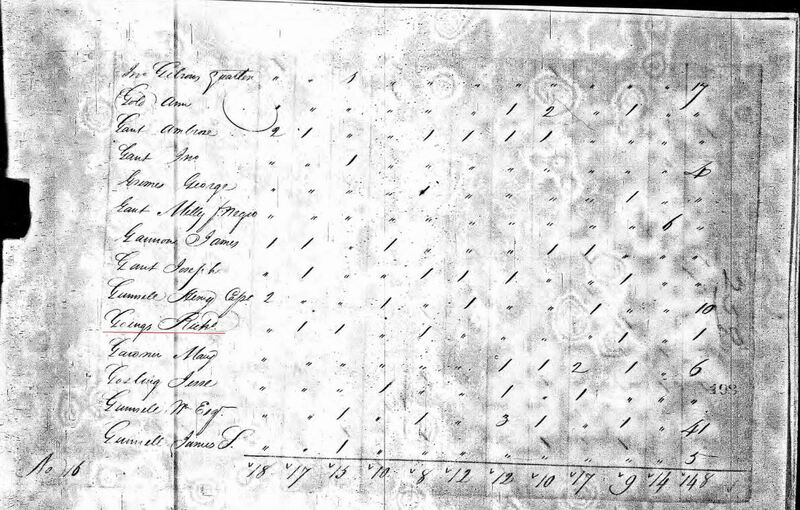 “Tennessee Probate Court Books, 1795-1927,” images, FamilySearch (https://familysearch.org/ark:/61903/3:1:S7WF-SKKP-99?cc=1909088&wc=M6Q7-NZ9%3A179638201%2C179975701 : 22 May 2014), Carroll > Settlements, 1869-1880, Vol. G > image 183 of 453; county courthouses, Tennessee. 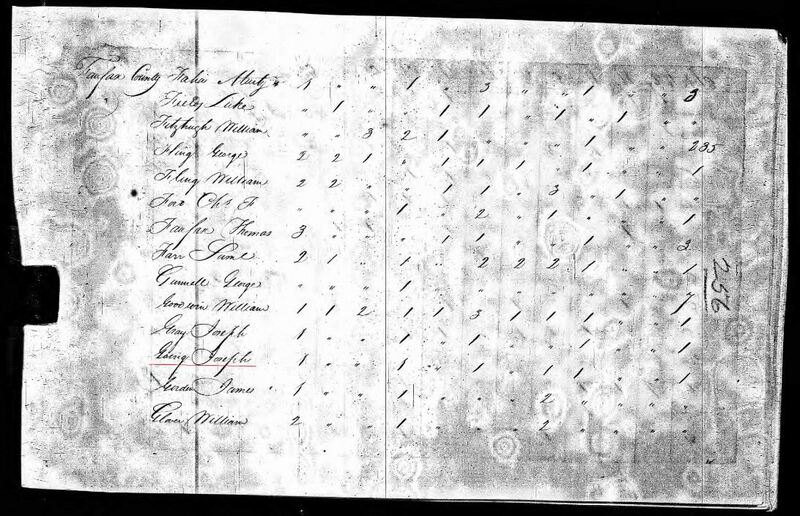 1770 Rent Rolls – Fairfax County, Va.
1774 Tax List – Fairfax County, Va.
who was born in 1770 in Scotland, according to Rev. Taylor. She was brought to America at the age of six by an aunt who settled in Charleston, South Carolina. William P. Grohse stated that she was born in Bedford County in 1772 to James Loving who was born in 1749 to Abraham Loving. Millie Loving Goins lost three uncles in the Revolutionary War. Richard Loving was a witness to the marriage of Mary Going to Meredith Childers December 12, 1791 in Henrico County. Goochland County was named for Sir William Gooch, lieutenant-governor of Virginia from 1727 to 1749. Goochland County was formed in 1727 from the western portion of Henrico County. At the time of its creation, the land of Goochland County included all or part of the present counties of Amherst, Appomattox, Albermarle, Bedford, Buckingham, Campbell, Cumberland, Fluvanna, Nelson and Powhatan. In 1744, the western portion of Goochland County was detached to form Albemarle County. In 1749, Cumberland County was created out of the part of Goochland County south of the James River. William Henry Gowan was born in Goochland County June 10, 1789, according to the research of Forrest Bruce Gowan, a great-great-grandson who lived in Jackson, Tennessee in 1991 and in 1998. In a letter of October 24, 1991 he was advised by a cousin that Joseph Henry Gowan was the father of William Henry Gowan. 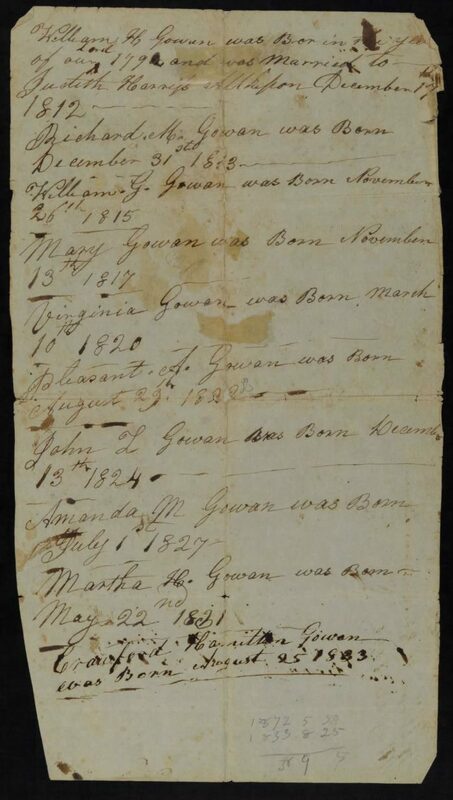 Other children of Joseph Henry Gowan were identified as John Gowan, Johnson Gowan, Joseph Gowan and an unnamed daughter. 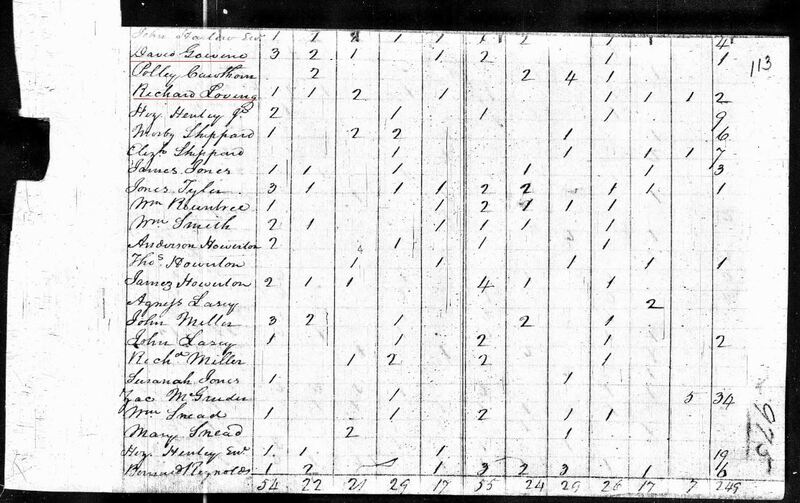 Pleasant Andrew Gowan, a son of William Henry Gowan, re­ported to the 1880 census enumerator of Carroll County, Ten­nessee that his father was born in the “District of Columbia.” The District of Columbia was surveyed in 1791 and dedicated in 1800 with land from Fairfax County, Virginia and Prince George County, Maryland. On the basis of this evidence, re­searchers should be on the lookout for the family of William Henry Gowan in Fairfax County around the turn of the century. He died September 9, 1870 at Spring Creek, Tennessee, ac­cording to “War of 1812 Pensioners” by Virgil D. White. Ju­dith Harriett “Juda” Atkinson Gowan received Widow’s Certifi­cate and Pension No. 5127 for his service in the War of 1812. Both died in Madison County and were buried in Lebanon Church Cemetery. Richard Marcellus Gowan, son of William Henry Gowan and Judith Harriet Atkinson Gowan, was born December 31, 1813 in Buckingham County. His tombstone show his date of birth as November 19, 1818. He was born in Hanover County, Vir­ginia, according to the death certificate of a son, Marcus Virgil Gowan. He was married about 1830, wife’s name unknown. He was remarried in 1831 to May Malvina Childress. It is be­lieved that May Malvina Childress Gowan died about two years later. He was married for the third time to Sousan McFarlin, who was born in 1821 to John McFarlin and Mary Brad­bury Mc­Farlin. They were named as defendants in January 1847 in a land dispute in Madison County, according to Madison County Court Minute Book 1, page 17.. In 1852 they lived in Carroll County. Sousan McFarlin Gowan died there September 4, 1854. He was married for the fourth time to Mary Jane McFarlin. She was born April 19, 1832 in Madison County. Richard Marcellus Gowan died there November 19, 1873 and was buried in Hope Hill Cemetery. She died June 7, 1881 and was buried beside her husband. Forrest Bruce Gowan wrote February 18, 1998, “Richard Marcellus Gowan was buried in Hope Hill Cemetery between Susan and Mary Jane. His stone, although present on my first visit, accompanied by Beatrice Gowan, his granddaughter, disappeared. It was no longer there on a subsequent visit I made to the Cemetery. I have made several inquiries, but no one seems to one what happened to the stone. Most of his family are buried there. Bill Gowan, son of Richard Marcellus Gowan and May Malvina Childress Gowan, was born about 1831. He was married about 1847 to Dicey Ledbetter. He died August 21, 1851, ac­cording to Forrest Bruce Gowan. One son and four daughters were born to Bill Gowan and Dicey Ledbetter Gowan, including John Franklin Gowan and Louisa J. Gowan, according to Forrest Bruce Gowan. Louisa J. Gowan Gowan who was born about 1851, was married about 1868 to a cousin, George H. Gowan, son of William Granville Gowan. Louisa J. Gowan Gowan lived to be 107. For details of her life and descendants, see George H. Gowan’s section. Lum Gowan, son of Richard Marcellus Gowan and May Malvina Childress Gowan, was born about 1833. He was killed and did not marry, according to Forrest Bruce Gowan. Sophia Gowan, daughter of Richard Marcellus Gowan and May Malvina Childress Gowan, was born about 1834. She was mar­ried about 1852 to Brodie Taylor. They lived in Arkansas. Thomas Franklin Gowan, son of Richard Marcellus Gowan and Sousan McFarlin Gowan, was born September 28, 1843 in Car­roll County. “Pvt. T. F. Gowan” served as a teenager in Com­pany D, 20th Tennessee Cavalry Regiment during the Civil War. He was married about 1866 to Susan Frances Debnam who was born in Maury County, Tennessee. Susan Frances Debnam Gowan died November 24, 1910 at age 63 of “near Lavinia of heart trouble,” according to Ten­nessee State Board of Health Death Certificate No. 6260 signed by Dr. J. P. Adams. She was buried in Hope Hill Cemetery. He died January 11, 1922 at age 78 of stomach cancer, ac­cording to Tennessee BVS Death Certificate No. 98 signed by G. W. Brasher, M.D. He was buried at Hope Hill Ceme­tery, ac­cording to Rudolph Gowan of Lavinia, Tennessee. Annie J. Gowan, daughter of Thomas Franklin Gowan and Su­san F. Debnam Gowan, was born in Tennessee about 1870 She was recorded at age 10 in the 1880 census. She was married about 1898 to John Cotton. Flaudia S. Gowan, of Thomas Franklin Gowan and Susan F. Deb­nam Gowan, was born May 30, 1872 in Tennessee. She appeared as an eight-year-old in the 1880 census. She was married about 1890 to William Alvin Augustus Rollins. James Alvin Rollins, son of William Alvin Augustus Rollins and Flaudia S. Gowan Rollins, was born June 19, 1906 in Gibson County, Tennessee. He was married March 21, 1930 to Rubye Lee Strayhorn. She was born April 13, 1906 at Lavinia, Tennessee to Mallie Panza Strayhorn and Mattie Elizabeth Alexander Strayhorn. Thomas Otha Gowan, son of Thomas Franklin Gowan and Susan F. Debnam Gowan, was born September 7, 1875 in Spring Creek, Tennessee. He appeared as a six-year-old in the 1880 census and at age 25 in the 1900 census of his father’s household. He was married December 29, 1907 to Mrs. Roma Enloe Askew Haddock, the widow of Marvin F. Haddock. She was born April 25, 1892 at Spring Creek to Joseph Augustus Askew and Amanda Emily Chestnut Gowan Askew. He died February 18, 1943 and was buried in Hope Hill Cemetery. She died May 6, 1966 at Jackson and was buried in Antioch Cemetery at Humboldt, Tennessee. Joseph Hollye Gowan, son of Thomas Otha Gowan and Roma Enloe Askew Gowan, was born March 8, 1904 at Spring Creek. He did not marry. He died May 31, 1978. Carl Thomas Gowan, son of Thomas Otha Gowan and Roma Enloe Askew Gowan, was born December 4, 1910 at Spring Creek. He died June 20, 1911 and was buried in Hope Hill Cemetery..
James Coy Gowan, son of Thomas Otha Gowan and Roma Enloe Askew Gowan, was born September 1, 1910 at Spring Creek. He was married August 20, 1938 to Alliene Smith who was born November 23, 1915. She was the daughter of Henry Douglas Smith and Laura Elizabeth Smith. James Coy Gowan died June 6, 1960 at Humboldt and was buried at Antioch Baptist Church Cemetery. She was remarried, husband’s name Cunningham. Nancy Carolyn Gowan, daughter of James Coy Gowan and Alliene Smith Gowan, was born January 22, 1941 at Jackson. She was married April 20, 1962 to William Luke Trice. He was born February 2, 1939 to William Lee Trice and Zelda Opal Allen Trice. In 1966 they lived in Memphis, Tennessee. Robert Glenn Gowan, son of James Coy Gowan and Alliene Smith Gowan, was born April 21, 1943 at Jackson. He was married February 11, 1972 to Mrs. Barbara Ann Casey Keltner, widow of Earl Wilson Keltner, at East Chester Church of Christ in Jackson. Earl Glenn Gowan, son of Earl Wilson Keltner and Barbara Ann Casey Keltner, was born December 30, 1969 in Jackson. His name was originally Earl Wilson Keltner, Jr.
Robert Lee Gowan, son of Thomas Franklin Gowan and Susan F. Debnam Gowan, was born about 1877. He appeared as a three-year-old in the 1880 census and at age 23 in the 1900 census. He did not marry. He died in 1943 and was buried in Hope Hill Cemetery. Richard Edgar Gowan, son of Thomas Franklin Gowan and Su­san F. Debnam Gowan, was born July 26, 1879 in Ten­nessee. He appeared at age 10 months in the 1880 census and at age 20 in the father’s household in 1900. He was married about 1902 to Lyn Edna Jacobs. Children born to Richard Edgar Gowan and Lynn Edna Jacobs Gowan are unknown. Maude O. Gowan, daughter of Thomas Franklin Gowan and Susan F. Debnam Gowan, was born in July 1881 in Tennes­see. She appeared at age 17 in the 1900 census of Carroll County. She was married about 1902 to Vester Wells. John Rudolph Gowan, son of Thomas Franklin Gowan and Susan F. Debnam Gowan, was born in Tennessee in July 1885. He ap­peared as a 14-year-old in the 1900 census. He was married about 1908 to Maude Wells. John Rudolph Gowan died in 1951 and was buried in Hope Hill Cemetery. Children born to John Rudolph Gowan and Maude Wells Gowan are unknown. Samuel V. Gowan, son of Thomas Franklin Gowan and Su­san F. Debnam Gowan, was born in April 1889. He ap­peared at age 11 in the 1900 census. He was married about 1912 to Mamie E. Adams. He died in 1928, according to his tombstone in Lavinia Cemetery. She died in 1973 and was buried beside her husband. Children born to Samuel V. Gowan and Mamie E. Adams Gowan are unknown. John Milton Gowan, son of Richard Marcellus Gowan and Su­san McFarlin Gowin, was born at Cedar Grove, Tennessee in Carroll County January 27, 1852. His tombstone shows “January 24, 1852.” He was married there De­cember 18, 1873 to Sarah Virginia Gowan, his cousin and daughter of his father’s brother. She was born in Carroll County April 4, 1856. John Milton Gowan became a car­penter. John Milton Gowan and Sarah Virginia Gowan Gowan re­moved in 1904 to Be­mis, Tennessee, a cottonmill town in Madison County where their eighth son was born. During the depression John Milton Gowan removed to Shreve­port, Louisiana, being influenced there by his sons. He re­turned to Bemis in 1935 and died there April 29, 1935 at age 83 “of apoplexy and senility,” according to Tennessee DVS Death Certificate No. 20506 signed by J. G. Cottingin, M.D. He was buried in Hope Hill Cemetery near Medina, Tennessee. He was a member of the Methodist Church, ac­cording to his obituary which reported that he was survived by his wife and nine chil­dren. He was married April 19, 1908 to Eva Lavinia John­son, who was born in Madison County January 20, 1887 to John Mar­tin Johnson and Margaret Elizabeth Johnson. He worked for 18 years at Bemis Bag Company and then operated a grocery store in Bemis. During World War II, at the age of 70, he was again employed at the bag company, retiring nine years later. He was a charter member, a steward and a bible school teacher of Be­mis Methodist Church. William Morris Gowan died at Bemis at age 92 Novem­ber 14, 1967 and was buried in Hollywood Cemetery in Jackson. Later Eva Lavinia Johnson Gowan lived at Hillcrest Conva­lescent Home. She died there at age 88, March 15, 1975 at Bemis and was buried be­side her husband. Bertha Opal Gowan, daughter of William Morris Gowan and Eva Lavinia Johnson Gowan, was born February 26, 1911 at Bemis. She was married about 1930 to Raymond Horry Tap­ley. She was a beautician. They continued in Bemis in 1975. She died in 1992, at age 81 and was buried in Hollywood Cemetery. Elsie Marie Gowan, daughter of William Morris Gowan and Eva Lavinia Johnson Gowan, was born May 16, 1916 at Be­mis. She was married July 14, 1934 to William Beecher Rus­sell. He was employed by Hays Freight Lines of Memphis. They re­moved to Memphis from Jackson in 1957, and she died there in 1962 survived by her husband and children. Irma Gowan, daughter of William Morris Gowan and Eva Lavinia Johnson Gowan, was born about 1919. She was mar­ried about 1940 to George Christian Core. In 1963, in 1975 and in 1992 she lived in Portland, Oregon. William Morris Gowan, Jr, son of William Morris Gowan and Eva Lavinia Johnson Gowan, was born December 21, 1923. He was married May 4, 1946 in Corinth, Mississippi to Gladys Venera Hilliard, daughter of Gould Vanderbildt Hilliard and Lacy Delene Holladay Hilliard. He continued at Bemis in 1975. Dennis Earl Gowan, son of William Morris Gowan, Jr. and Gladys Venera Hilliard Gowan, was born May 14, 1950 in Jackson. He was married in Jefferson City, Tennessee April 2, 1978 to Bethann Gentry. She was born February 8, 1951 to Thomas Gentry and Ellen Gentry. In 1981 and 1985 they lived at Jasper, Tennessee. Teresa Lynn Gowan, daughter of William Morris Gowan, Jr. and Gladys Venera Hilliard Gowan, was born November 12, 1963 at Jackson. She was married September 11, 1981 at Jack­son to Stanley Brian Mitchell. He was born October 28, 1959 at Tacoma, Washington to Roy Neal Mitchell and Delinda Frances Miller Mitchell. In 1985 they lived in Mesquite, Texas, and in 1986 they were back in Jackson. James Thomas Gowan, son of John Milton Gowan and Sarah Virginia Gowan Gowan, was born in Carroll County, Octo­ber 20, 1876. He ap­peared in the 1880 census of Carroll County as a 4 year-old. On July 13, 1905 he was married to Maude Man­ning Zachary. She was born June 15, 1887 in Hays County, Texas to Joseph Hampton Zachary and Euge­nia Atkinson Zachary. Later he lived at Cedar Grove, Ten­nessee, near Be­mis, where his parents had moved in 1904. James Thomas Gowan and Maude Manning Zachary Gow­an, were listed in the 1926-27 Shreveport, city directory re­siding at 3412 Mansfield Road. In 1928 and 1929 editions he was shown as the oper­ator of Gowan Brothers Sandwich Shop, still residing at 3412 Mans­field Road. The 1930 edition revealed that Gowan Brothers Sandwich Shop was operated by James Thomas Gowan and Richard Ester Gowan. “Mrs. Maude Gowan” was showed as a waitress in the cafe in 1931, residence at 3420 Mansfield Road. He continued the op­eration of the Sandwich Shop in 1931, but had returned to Be­mis by 1935. He was a charter member and a steward of Bemis Methodist church. He died March 24, 1964 at Bemis and was buried in Hollywood Cemetery. She died January 24, 1977, at age 89 in Floridian Nursing Home in Miami, Florida and was buried be­side her husband. Frances Elizabeth Gowan, daughter of James Thomas Gow­an and Maude Manning Zachary Gowan, was born Septem­ber 28, 1907 in Bemis. “Miss Eliz Gowan” was shown as a teacher in the 1927 through 1935 editions of the Shreve­port city directo­ries, employed at the Queensborough School. In 1927 through 1931 she was living at 3420 Mansfield Road near the residence of James Thomas Gowan. In 1932 she was living at 1110 Prospect Avenue. In 1933 she was living at 712 Christian and in 1934 at 230 Wall. In 1935 she was listed at 2610 Gilbert. She was married June 16, 1936 at Jackson to James Ben­jamin Stalvey who was born December 9, 1908 in Pittsboro, North Carolina. He was the son of Archie Boyd Stalvey and Daisy Sessions Stalvey. No children were born to them. In 1964 and in 1993 they lived in South Miami, Florida. James Curtis Gowan, son of James Thomas Gowan and Maude Manning Zachary Gowan, was born September 10, 1911 at Bemis. He was shown living at 3420 Mansfield Road ac­cording to the 1929 through 1931 editions of the Shreve­port city directory. “J. C. Gowan” was shown to be a helper at Shreve­port Lamp Chimney Company during this period. In 1930 and 1931 he was employed as a helper at Gowan Brothers Sandwich Shop. In 1932 James Curtis Gowan was shown as a helper at Joseph A. Gowan Sandwich Shop No. 2 and lived at 3415 Mansfield Road. In 1933 he was waiter em­ployed by Joseph Augustus Gowan and was living at 3330 Mansfield Road. James Curtis Gowan did not ap­pear in the di­rectory subsequent to that date. He was married March 15, 1946 in Corinth, Mississippi to An­nette Massenburg. She was born July 11, 1923 at Jackson to Clyde Davis Massenburg and Constance Summer Massenburg. She was the daughter of Clyde Davis Massenburg and Constance Summer Massenburg. In 1957 they continued in Jackson. In 1993 they lived in McAllen, Texas. He died there November 6, 1994, and his body was cremated. Jennie Elizabeth Gowan, daughter of James Curtis Gowan and Annette Massenburg Gowan, was born September 29, 1957 at Jackson. Katherine Mable Gowan, daughter of James Thomas Gowan and Maude Manning Zachary Gowan, was born July 1, 1914 in Bemis. She died January 25, 1915 at 18 months of “constipation of stomach and bowels, aggravated by an ob­struction,” according to Tennessee BVS Death Certificate No. 200 signed by H. E. Brown, M.D. She was buried in Holly­wood Cemetery, according to Mrs. E. B. Gowan, in­formant. Robbie Lee Gowan, daughter of James Thomas Gowan and Maude Manning Zachary Gowan, was born October 27, 1918 at Bemis. She was married October 28, 1941 to John Thornton Master­son in New York City. He was born March 1, 1911 in Kingston, New York to William Harry Masterson and Ethelyn Thornton Masterson. Robbie Lee Gowan Masterson became a concert pianist. In 1964 they lived in Larchmont, New York where he died November 13, 1980. Sarah Eugenia Masterson, daughter of John Thornton Masterson and Robbie Lee Gowan Masterson, was born December 15, 1942 in Brooklyn, New York. She was married June 22, 1963 to David Clayton Daneker, son of Clayton Daneker and Mildred Ziethen Daneker. He was born September 25, 1941 in Baltimore, Maryland. In 1965 they lived in Boston and in 1966 in Baltimore. John Thornton Masterson, Jr, son of John Thornton Masterson and Robbie Lee Gowan Masterson, was born August 1, 1946 in Brooklyn. He was married April 20, 1968 to Nancy Sether, daughter of James Wendell Sether and Hallie Fairbank Sether. She was born August 20, 1948. In 1968 they lived at Wooster, Ohio and in 1972 at Princton, New Jersey. Thomas Eugene Gowan, son of James Thomas Gowan and Maude Manning Zachary Gowan, was born June 16, 1921. He served in the U. S. Army during World War II, from 1940 to 1945, primarily in the European theatre. He was married July 11, 1947 to Helen Raney in Bayside, New York. She was born September 3, 1927 in Portland, Oregon to George Wil­liam Raney and Helen Louise Smith Raney. They lived in Long Island, New York, and he was employed as a printing production manager in New York City and in Fair­field, New Jersey. In 1967 they lived in North Babylon, New York. Upon retirement, they removed to Grand Junction, Col­orado. He died there February 12, 1991 of colon cancer. In the latter part of the year Helen Raney Gowan, a member of Gowen Re­search Foundation, lived in Westminster, Col­orado. Michael Andrew Gowan, son of Thomas Eugene Gowan and Helen Raney Gowan, was born June 13, 1948 in Flushing, New York. He was married to Katherine Marsh Dell Platt in Denver, Colorado April 26, 1987. In 1991 they lived in Lakewood, Colorado with Aaron Platt, son by a previous marriage. He was remarried June 21, 1995 to Susan R. Eisaman. In 1997 they, members of Gowen Research Foundation, lived in Aurora, Colorado. Katherine Ann Gowan, daughter of Thomas Eugene Gowan and Helen Raney Gowan, was born November 21, 1949 in Rochester, New York. She was married June 14, 1976 in Reno, Nevada to Billy Joe Black. In 1991 they lived in Porterville, California. Peter Allen Gowan, son of Thomas Eugene Gowan and He­len Raney Gowan, was born May 28, 1951 in Flushing. He was married June 2, 1986 in Santa Fe, New Mexico to Faith Hamilton of Philadelphia. In 1991 they lived in Boulder, Col­orado. James Zachary Gowan, son of Thomas Eugene Gowan and He­len Raney Gowan, was born June 16, 1954 in Flushing. He was married about 1977 to Tami Britten at Brighton, Colorado. They were divorced about 1981. Odell Gowan, a shipping clerk employed by Western Auto Supply, lived at 4146 Mansfield, according to the 1930 edition of the directory. In 1931 he was shown living at 2615 Dupont, the address of Richard Esters Gowan In 1932 he was listed as a mechanic at Fairway Garage living at 2537 Dupont, again the address of Richard Edward Gowan. In 1933 his address was 2915 Milton. He does not reappear in the di­rectory subsequent to that date. “Bolivar, Tennessee–Mrs. Blanche Smith Gowan, 82, died at her home early this morning in Grand Junc­tion. She was a lifelong resident of Hardeman County and had been in ill health for a long time. She was a Methodist. Burial will be in Grand Junction Ceme­tery. He lived at Jackson in May 1965 and died November 19, 1967 at Bolivar and was buried there. It is believed that no chil­dren were born to Luther Lawton “Laudie” Gowan and Blanche Smith Gowan. Mary Alma Gowan, daughter of Luther Lawton “Laudie” Gowan and Narissa Richardson Gowan, was born August 8, 1902. She was married September 23, 1923 to Warren Franklin Owens. He was born in September 1902 to Noah Franklin Owens and Alice Elizabeth Ray Owens at Bolivar, Tennessee. In 1985 and in 1993 Mary Alma Gowan Owens lived in Seabrook, Texas. John Hastings Gowan, son of Luther Lawton “Laudie” Gowan and Narissa Richardson Gowan, was born July 10, 1904. He was deceased by 1985. Of this individual nothing more is known. Edna Frances Gowan, daughter of Luther Lawton “Laudie” Gowan and Narissa Richardson Gowan, was born September 6, 1906 in Carroll County.. She was married about 1925 to Hu­bert E. Scammerhorn. He died in 1953. She lived in Abilene, Texas, but had returned to Jackson shortly before she died in June 1985. Her funeral services were held June 18, 1985, and she was buried in Pleasant Hills Cemetery. William Andrew Gowan, son of Luther Lawton “Laudie” Gowan and Narissa Richardson Gowan, was born November 17, 1908. He was married about 1931 to Ruby Grissom. William Andrew Gowan lived in Jackson in 1985. Children born to William Andrew Gowan and Ruby Grissom Gowan are unknown. Ruby Gowan, daughter of Luther Lawton “Laudie” Gowan and Narissa Richardson Gowan, was born about 1911. She was married about 1930 to Orrie McConally. She was de­ceased by 1985. Virginia Gowan, daughter of Luther Lawton “Laudie” Gowan and Narissa Richardson Gowan, was born about 1914. She was married about 1934 to John Carter. In 1985 Virginia Gowan Carter lived in San Antonio, Texas. Edwin Bruce Gowan, son of John Milton Gowan and Sarah Virginia Gowan Gowan, was born May 3, 1881 in Carroll County. He was married at Bemis December 18, 1904 to Esther Hatton Douglass, daughter of Andrew Kerr Douglass and Vir­ginia Davis Felts Douglass. She was born June 24, 1886 in Cheatham County, Tennessee. He worked on the GM&O Rail­road and became a Methodist preacher in 1920. She died in Jackson, Tennessee August 29, 1961 at age 75, and he died there November 20, 1982 at the age of 101. He was a member of Knights of Pythias and the Brotherhood of Railroad Carmen. They were buried in Hollywood Ceme­tery. Lois Virginia Gowan, daughter of Edwin Bruce Gowan and Esther Hatton Douglass Gowan, was born September 29, 1905 in Humboldt, Tennessee. In 1933 she was living in Shreveport with her uncle, Richard Ester Gowan. She was married about 1934 to Enlowe Wylie Turner. In 1961 they lived at Jackson, Mississippi. In 1973 and in 1982 Lois Gowan Turner, a widow, lived at 424 Lexington Avenue, Jackson. Forrest Bruce Gowan, son of Edwin Bruce Gowan and Es­ther Hatton Douglass Gowan, was born December 8, 1908 in Jack­son. “Forrest B. Gowan” was a waiter in Joseph Augus­tus Gowan’s Sandwich Shop in 1929 and lived at 1748 Buck­ner Avenue, according to the Shreveport city directory. In 1932 he was listed as a waiter in the sandwich shop living at 3415 Mansfield Road. He did not reappear in the directory after that date. He was married November 3, 1939 at Jackson to Sarah Emily Tyree, daughter of Arthur Perry Tyree and Sally Melissa Enochs Tyree. She was born December 4, 1917. During World War II, he served as a infantry captain in the U.S. Army. He served in the North African campaign which was followed by duty in Sicily, Italy, France and Germany. He made the landing at Anzio beachhead. His company ar­rived in southern France aboard the Assault Boat St. Rafael and ad­vanced to Germany. He crossed the Rhine River at Remagen [“One Bridge Too Far”] and pushed into Germany. Upon returning home, he was a member of St. John’s Ma­sonic Lodge No. 332. He served as High Priest of the Clinton Chap­ter of Royal Arch Masons. He served as Illustrious Master, Jackson County No. 13 of Royal and Select Masters. He was Commander of Jackson Commandary No. 13 of Knights Tem­plar. He was president of West Tennessee Area York Rite As­sociation. He served as commander of Jackson Post No. 7, Dis­abled American Veterans, commander of the Eighth District Disabled American Veterans and vice com­mander, Department of Tennessee, Disabled American Vet­erans. In 1993, Forrest Bruce Gowan and Sarah Tyree Gowan con­tinued in Jackson. He died there August 21, 1998, according to his widow. Bruce Tyree Gowan, son of Forrest Bruce Gowan and Sarah Emily Tyree Gowan, was born August 17, 1948 at Jackson. He was married August 2, 1969 to Marsha Ann Mullins. She was born at Jackson September 23, 1948 to Luther James Mullins and Willie D. Morse Mullins. In 1984 and in 1987 they lived in Broward County, Florida. Andrew Douglass Gowan, son of Forrest Bruce Gowan and Sarah Emily Tyree Gowan, was born September 11, 1952 at Jackson. He was married October 4, 1975 to Pamela June Burgess. Douglass Grady Gowan, son of Edwin Bruce Gowan and Es­ther Hatton Douglass Gowan, was born April 29, 1911 in Jack­son. He was married August 26, 1948 to Martha Lurlyne Vestal. He was employed by the City of Jackson, Utilities Di­vision and retired as chief accountant from that division. He died July 5, 1991 and was buried in Hollywood Cemetery. No children were born to Douglass Grady Gowan and Mar­tha Lurlyne Vestal Gowan. James Wesley Gowan, son of Edwin Bruce Gowan and Es­ther Hatton Douglass Gowan, was born August 13, 1913 at Jackson. “James Wiley Gowan” died September 17, 1915, at age 2 “of malarial fever and meningitis,” according to Ten­nessee BVS Death Certificate No. 25815 signed by A. Hern­don, M.D. He was buried in Hollywood Cemetery. Martha Frances Gowan, daughter of Edwin Bruce Gowan and Esther Hatton Douglass Gowan, was born January 20, 1918 at Jackson. She was married about 1938 to James Hil­liard. Later she was remarried to Milton Rhodes. In 1961 they lived in Phoenix, Arizona. She lived in Memphis in 1982. She was married for the third time September 1, 1984 to William Nicely. Jane Ellen Gowan, daughter of Edwin Bruce Gowan and Esther Hatton Douglass Gowan, was born November 7, 1920. She was married about 1939 to William Lee Brien. In 1982 she lived in Huntsville, Alabama. Emily Frances “Emma” Gowan, daughter of John Milton Gowan and Sarah Vir­ginia Gowan Gowan was born March 13, 1883 in Carroll County. She died January 30, 1907 un­married and was buried in Hollywood Cemetery. Joseph Augustus Gowan, son of John Milton Gowan and Sarah Virginia Gowan Gowan, was born January 25, 1885 in Cedar Grove, Tennessee. He was the first of several mem­bers of the family to remove to Shreveport, Louisiana. He shown as a clerk there in the 1920 and 1921 editions of the city directory. He was employed by a restaurant in 1922 and roomed at 1310 Jew­ell Avenue, the home of his mother, dur­ing this period. He was married November 11, 1925 in Texarkana, Texas to Jessica L. Myers. She was born August 19, 1901 to Wilson Allen Myers and Minnie Ellen Ackley Myers in Rossville, Kansas. He was listed as the proprietor of Gowan’s Sandwich Shop in 1923-24-25-26 editions of the direc­tory. In the 1927 and 1928 edi­tions two restaurants were listed in his name. His wife, “Jessie L. Gowan,” was listed with him. In 1928-29-30 he was shown to be in the restaurant business at 1039-41 Jordan Av­enue and listed lived at 2801 Highland. His business address re­mained the same, but his residence was lo­cated at 712 Chris­tian in 1931-1932. In 1932 two locations were listed for Gowan’s Sandwich Shops, one at 1041 Jordan and one at 3415 Mansfield Road. In 1933-34-35 the sandwich shop was shown at the same ad­dress, but the couple lived at 712 Chris­tian in 1933, 1319 Fair­field in 1934, back to 712 Christian in 1935. No mention is made of the sandwich shop in 1936, but the couple was listed as living at 712 Auten Place. They con­tinued at that address in 1937, 1939, 1940 and 1941. In 1939 Joseph Augustus Gowan, was shown as a salesman, Jessica L. Myers Gowan and their four children were listed in the city directory. “Mrs. Jessie M. Gowan was listed as a busi­ness col­lege student in the 1940 directory, living at 712 Austin Place. Joseph Augustus Gowan continued in Shreve­port in 1943. Joseph Augustus Gowan in 1965 and in 1967 was a resident of Jackson, Mis­sissippi and died there February 2, 1972 and was buried there. Jessica L. Myers Gowan died in Bakers­field Cali­fornia September 13, 1977 and was buried beside her husband. Joseph Augustus Gowan, Jr, son of Joseph Augustus Gowan and Jessica L. Myers Gowan, was born October 21, 1926 in Shreveport. He did not marry. In 1993 he lived in New Or­leans. John William Gowan, son of Joseph Augustus Gowan and Jes­sica L. Myers Gowan, was born November 1, 1928 in Shreve­port. He died July 8, 1978 at the age of 49, unmarried. Jessica Myers Gowan, daughter of Joseph Augustus Gowan and Jessica L. Myers Gowan, was born August 5, 1930 at Shreve­port. She was married July 5, 1950 to William E. Schmidt, Jr. In 1993 she lived in Houston, Texas. James Nelson Gowan, son of Joseph Augustus Gowan and Jes­sica L. Myers Gowan, was born June 1, 1932 in Shreve­port. He was married about 1955 to Barbara Jean Powers. Children born to James Nelson Gowan and Barbara Jean Powers Gowan are unknown. Richard Ester Gowan, son of John Milton Gowan and Sarah Virginia Gowan Gowan was born in Carroll County Novem­ber 20, 1886. He was married January 15, 1910 to Laura Frances Williams. She was born March 12, 1889 to George Samuel Williams and Nannie B. Elinor Williams in Carroll County. Richard Ester Gowan was shown in the 1924 edition of the Shreveport city directory as a waiter employed at Gowan Sandwich Shop at 1033 Jordan Avenue. His resi­dence was shown as 2114 Claiborne Avenue and remained the same in each edition until 1930 when they were shown living at 4146 Mansfield Road. He was shown as the propri­etor of Ed Gowan’s Sandwich Shop at that time. In the 1931 edition of the directory he was listed as a tractor driver, living at 1615 DuPont with his wife, “Laura Gowan.” In 1932 he was shown as a laborer for American Service Com­pany continuing to live at the same address with Laura Frances Williams Gowan. In 1933 he was listed as a dragline operator living at 2826 Cather­ine. His niece, “Lois Gowan” lived with them. In 1934 he lived at 2615 Carol. In 1935 he was listed as a contractor do­ing painting, pa­perhanging and decorating at 2615 Coral. They did not appear in the Shreve­port di­rectories after 1935. “A 79-year-old pensioner was stabbed to death with a knife that had been given to him as a birthday present, and police said Sunday the motive appeared to be rob­bery. Cut five times in the chest and twice in the back, Richard Gowan, a retired janitor for the Houston In­dependent School District, died on the floor of the bed­room in his small home at 1220 W. 26th Street. Homocide Detective J. L. Marquis said the death weapon, a fishing knife with a 4-inch blade, lay beside the body. The knife had been given to Gowan by a rela­tive on his birthday in November, Marquis said. Gowan was last seen alive at 7 p.m. Saturday when he left the home of his daughter, Mrs. Frances Ingram, 1221 W. 25th, after a visit. Mrs. Ingram found the body, clad in pajamas, at 4:30 p.m. Sunday. Marquis said an autopsy would be per­formed to determine the time of death. The bedroom had been ransacked. The clothes Gowan wore when he visited his daughter, as well as his fishing tackle box–the one the knife had been in–were found in the back­yard. The screen on the kitchen window had been removed, and the refrigerator door slightly open when officers ar­rived. Mrs. Ingram told Marquis her father had re­cently received his pension check and should have had $50 to $60. Marquis said it appeared that whoever robbed Gowan came in through the kitchen window, picked up his clothes and tackle box in the bedroom and took them outside to the backyard while Gowan slept. Richard Ester Gowan was buried in Brookside Memorial Park. Laura Frances Williams Gowan died there February 6, 1966 and was buried beside her husband. In addition to their chil­dren, they were survived by five grandchildren and seven great-grandchildren. Clinton Odell Gowan, son of Richard Ester Gowan and Laura Frances Williams Gowan, was born November 4, 1910 at Be­mis, according to Texas BVS File 1217793. “Odell Gowan,” a shipping clerk employed by Western Auto Supply, lived at 4146 Mansfield, according to the 1930 edition of the directory. In 1931 he was shown living at 2615 Dupont, the address of Richard Ester Gowan In 1932 he was listed as a mechanic at Fairway Garage living at 2537 Dupont, again the address of Richard Ester Gowan. In 1933 his address was 2915 Milton. He does not reappear in the di­rectory sub­sequent to that date. He was married July 14, 1933 in Shreveport to Anna Virginia Cross. She was born January 16, 1913 in McGregor, Texas to William Morgan Cross and Eula May Alexander Cross. They removed to Houston, Texas where he established a sheet metal busi­ness. They received a warranty deed from George D. Ehren­fried February 11, 1958 to Lot 21, Lake Forest Lodge, ac­cording to Montgomery County Deed Book 443, page 388. In 1960 they lived at 812 Wakefield, Houston. In 1972 they lived at 2034 Willomoss Street, Houston. He was show in the 1972 telephone directory as president of Gowan Sheet Metal, Inc. He died in June 1989. Clinton Odell Gowan, Jr, son of Clinton Odell Gowan and Anna Virginia Cross Gowan, was born in Houston Decem­ber 29, 1934, according to Texas BVS File 103264. In 1972 he, a vice-president of Gowan Sheet Metal, Inc. and his wife, Vivian E. Gowan lived at 1139 West Thornton Street, Hous­ton, ac­cording to the telephone directory. Arthur Damon Gowan, son of Clinton Odell Gowan and Anna Virginia Cross Gowan, was born in Houston August 9, 1936, according to BVS File 61281. In 1972 he, a vice-presi­dent of Gowan Sheet Metal, Inc. and his wife, Carolyn M. Gowan, lived at 4911 Gulf Street, Houston, according to the telephone directory. Frances Olean Gowan, daughter of Richard Ester Gowan and Laura Frances Williams Gowan, was born October 25, 1912 at Bemis. In the 1930 edition of the Shreveport city di­rectory she was shown as a waitress in Ed Gowan’s Sandwich Shop Living at 4146 Mans­field Road. In 1931 she was living in the resi­dence of her par­ents at 2615 Milton. In 1934 she was living in her parent’s household at 2516 Coral. She re­moved along with her parents to Houston. She was married there December 11, 1940 to Henry Clay Ingram. He was born December 19, 1907 at Waco, Texas to Isaac Ingram and Winnie Newman Ingram. Henry Clay Ingram died July 5, 1967 in Waco and was buried there. She lived in Miami in Octo­ber 1973 and continued there in 1991. Ethel May Gowan, daughter of John Milton Gowan and Sarah Vir­ginia Gowan Gowan was born August 25, 1889 in Carroll County. She died unmarried May 29, 1939 at Bemis and was buried in Hope Hill Cemetery beside her parents..
Earl Vance Gowan, son of Joseph Milton Gowan and Sarah Vir­ginia Gowan Gowan, was born September 20, 1892 in Carroll County. His death certificate showed his father [erroneously] as John Pirtle Gowan. Earl Vance Gowan was married about 1917 to Julia Ann Garrett, daughter of Rufus Woodrow Garrett, who was born in Mis­souri June 11, 1900. The Garrett family had come to the Bemis area in 1914. He became a watchmaker. “She leaves six daughters, Mrs. Ellen Russell, Mrs. Vir­ginia Perry and Mrs. Reba Robertson, all of Jack­son; Mrs. Lydia Perry of the Bemis area; Mrs. Berdise Stew­art of Henderson and Mrs. Mrs. Eleanor Mul­likin of Jackson; two sons Rubus Earl Gowan of Zachary, Louisiana and William Earl Francis of Memphis; a sis­ter, Mrs. Harriet Tosh of the Bemis area; 17 grandchil­dren, 24 great-grandchildren and a great-great-grand­child.”. Norma Virginia Gowan, daughter of Earl Vance Gowan and Julia Ann Garrett Gowan, was born June 11, 1918. She was married about 1940 to Thomas Allen Francis. Ellen Rebeccah Gowan, daughter of Earl Vance Gowan and Ju­lia Ann Garrett Gowan, was born January 19, 1920 at Be­mis. She was married about 1940 to Wallace Russell. In 1981 they lived at Jackson. Anna Quindiline Gowan, daughter of Earl Vance Gowan and Julia Ann Garrett Gowan, was born October 19, 1922. She died January 27, 1924, at age 1 of bronchial pneumonia, according to Tennessee BVS Death Certificate No. 138 and was buried in Bemis Cemetery. Lydia Ann Nell Gowan, daughter of Earl Vance Gowan and Julia Ann Garrett Gowan, was born May 19, 1925. She was married about 1946 to Dennis Perry. In 1981 they lived near Bemis. Berdice Geneva Gowan, daughter of Earl Vance Gowan and Julia Ann Garrett Gowan, was born about 1928. She was mar­ried about 1949 to Raymond Stewart. In 1981 they lived at Henderson, Tennessee. Rufus Earl Gowan, son of Earl Vance Gowan and Julia Ann Garrett Gowan, was born about 1931. He was married about 1954 to Donna Mullican. In 1981 Rufus Earl Gowan and Donna Mullican Gowan lived in Zachary, Louisiana. un­known. Nora Eleanor Gowan, daughter of Earl Vance Gowan and Julia Ann Garrett Gowan, was born about 1934. She was married about 1954 to Willie Mullican. In 1981 they lived at Jackson. John Milton Gowan, Jr, son of John Milton Gowan and Sarah Virginia Gowan Gowan, was born November 20, 1894 in Car­roll County. He was shown as a waiter and operator of Ed Gowan’s Sandwich Shop in 1922-23-24-25, according to the Shreveport city directories. In 1928 and 1929 he was shown to be a cook living at 1309 Jordan Avenue, rear, with his wife, Berdise Baker Gowan. She was born in 1898 in Texarkana, Arkansas. In 1926 and 1927 the couple the cou­ple lived at 1835 Southern Avenue. In 1929 he lived at 1748 Buckner Av­enue, and 2809 Catherine Avenue in 1930. From 1931 until Octo­ber 1973 they lived at 2920 College Av­enue in Shreve­port. He was listed as a cook and waiter in the restau­rant of his brother, Joseph Augustus Gowan in the city di­rectories for 1931, 1932, 1933 and 1934. In 1935 John Mil­ton Gowan, Jr. and Berdise Baker Gowan took over the opera­tion of the restaurant when it went into bankruptcy and op­erated it for the next 24 years as Gowan’s Lunch. The restaurant was lo­cated at 1702 Texas Avenue. He continued in Shreveport in 1943. In 1965 he was shown in Shreveport, and In 1967 he lived at Blanchard, Louisiana. In October 1973 John Milton Gowan, Jr. an invalid, and Berdise Baker Gowan continued to live at 2920 West College in Shreveport. She died December 2, 1973, and he died De­cember 29, 1973. They were buried in Shreveport. No chil­dren were born to John Milton Gowan, Jr. and Berdise Baker Gowan. Amanda Emily Gowan, daughter of Richard Marcellus Gowan and Sousan McFarlin Gowan, was born August 31, 1854 in Carroll County. Her mother died when she was four days old, and she was taken to raise by her half sister, Sophia Gowan Taylor in Arkansas. 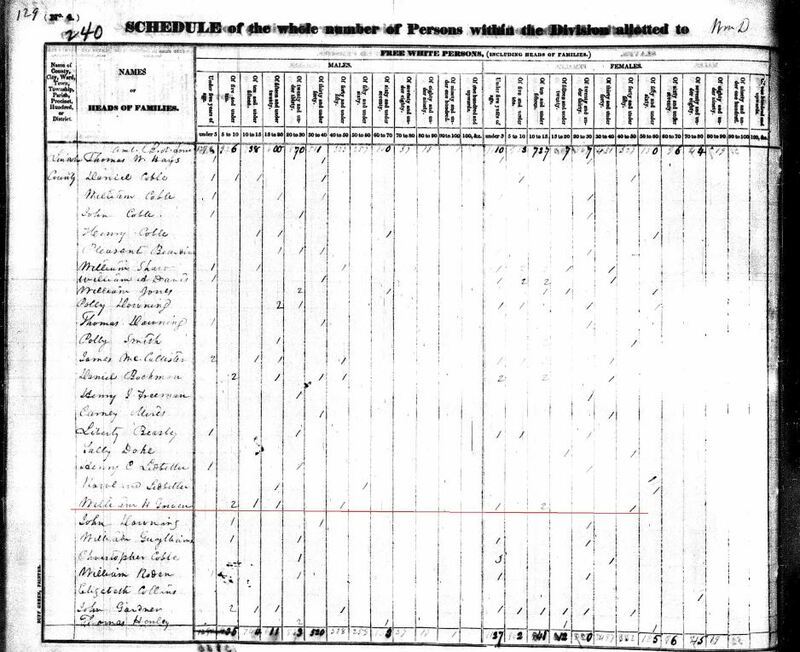 Amanda Emily Gowan was re­corded back in Tennessee in the 1860 census however. She was married August 5, 1873 to James Augustus Chestnut. She was remarried about 1880, husband’s name Askew. She was remarried to Frank M. Tubbs September 5, 1905, ac­cording to Forrest Bruce Gowan. He was born April 3, 1838 and died January 23, 1925. He was buried in Hope Hill Cemetery. Amanda Emily Gowan Chestnut Tubbs died December 24, 1939 at Spring Creek, Tennessee and was buried beside her parents in Hopewell Cemetery. Roma Enloe Askew, daughter of Amanda Emily Gowan Chestnut Askew, was born April 25, 1892 at Spring Creek. S She was married December 29, 1907 to her cousin, Thomas Otha Gowan. For their children, see his section of the manuscript. Virginia Ann “Jennie” Gowan, daughter of Richard Marcel­lus Gowan and Mary Jane McFarlin Gowan, was born about 1855. She was married about 1874 to Monroe Holden. In 1935 she continued at Jackson. Mattie H. Gowan, daughter of Richard Marcellus Gowan and Mary Jane McFarlin Gowan, was born June 26, 1857. She was de­ceased by 1935. Of this individual nothing more is known. Emma J. Martha Gowan, daughter of Richard Marcellus Gowan and Mary Jane McFarlin Gowan, was born in 1859, according to her tombstone. She was married about 1877 to George W. Jacobs who was born in 1851. She lived at Spring Creek, Tennessee in 1935. He died in 1910, and she died in 1936. They were buried in Hope Hill Cemetery. Ellar Gowan, daughter of Richard Marcellus Gowan and Mary Jane McFarlin Gowan, was born January 1, 1862. She was married about 1880 to B. F. Pickens. She died October 10, 1885, according to her tombstone in Hope Hill Cemetery. Fannie Gowan, daughter of Richard Marcellus Gowan and Mary Jane McFarlin Gowan, was born June 27, 1864. She died November 20, 1864 and was buried in Hope Hill Cemetery..
Ada Gowan, daughter of Richard Marcellus Gowan and Mary Jane McFarlin Gowan, was born about 1867. She was deceased by 1935. Of this individual nothing more is known. Bert Gowan, son of Richard Marcellus Gowan and Mary Jane McFarlin Gowan, was born about 1868. He was de­ceased by 1935. Of this individ­ual nothing more is known. Marcus Virgil Gowan, son of Richard Marcellus Gowan and Mary Jane McFarlin Gowan, was born June 27, 1870 in Madi­son County. “Mark Gowan” was enumerated in the 1880 cen­sus of Gibson County, Tennessee Enumeration Dis­trict 32, page 6, Civil District 1. He was nine-years old, born in Tennessee and living in the home of Jessie Gardner. He was married about 1893 to Ida Warmoth. 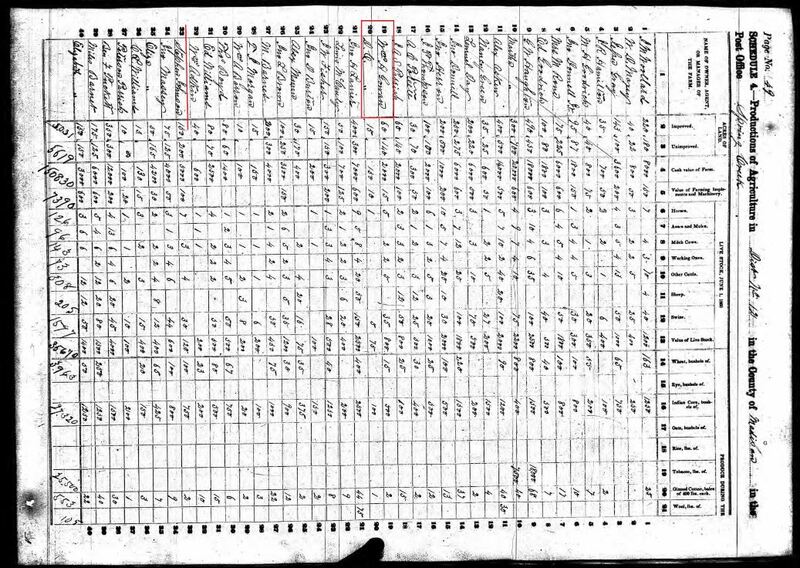 “Mark V. Gowan, 29, born in Tennessee in June 1870, living alone” was enumerated as the head of a house­hold in the 1900 census of Gibson County, Enumeration District 20, page 6. “Mark V. Gowan, a married man and a traveling salesman” died December 10, 1919 “of pulmonary tuberculosis follow­ing dia­betes mellitus” at Medina, Tennessee in Gibson County, ac­cording to Tennessee BVS Death Certificate No. 568, signed by G. W. Oliver, M.D. of Medina. He was buried in Mt. Zion Cemetery, according to Knox Ja­cobs, informant of Medina. Katherine Gowan, daughter of Marcus Virgil Gowan and Ida Warmoth Gowan, was born March 5, 1910. Of this individ­ual nothing more is known. Marcus Virgil Gowan, son of Marcus Virgil Gowan and Ida Warmoth Gowan, was born October 5, 1912. He was mar­ried about 1935 to Virginia Hatley. Children born to Marcus Virgil Gowan and Virginia Hatley Gowan are unknown. Paul Gowan, son of Marcus Virgil Gowan and Ida Warmoth Gowan, was born September 11, 1916. He was married about 1940 to Nancy Virginia Wright. Children born to Paul Gowan and Nancy Virginia Wright are unknown. Beatrice Gowan, daughter of Luther Marcellus Gowan and Mattie Magdalene Jacobs Gowan, was born October 8, 1902 in Gibson County, Tennessee. She did not marry. In 1989 she continued in Jackson. Richard Wade Gowan, son of Luther Marcellus Gowan and Mattie Magdalene Jacobs Gowan, was born February 18, 1905. He was married about 1928 to Virginia Hamilton. He died October 4, 1974 and was buried in Hope Hiull Cemetery. Children born to Richard Wade Gowan and Vir­ginia Hamilton Gowan are unknown. Alfred Jennings Gowan, son of Luther Marcellus Gowan and Mattie Magdalene Jacobs Gowan, was born August 12, 1907. He was married about 1928, wife’s name unknown. He was remarried about 1935 to Christina Trout. He died before 1989. Children born to Alfred Jennings Gowan and Christina Trout Gowan are unknown. Robbie Lee Gowan, daughter of Luther Marcellus Gowan and Mattie Magdalene Jacobs Gowan, was born February 27, 1910. She was married about 1929 to Uckle Samuel Bell. In 1989 she lived in Kennewick, Washington. Mary Sue Gowan, daughter of Luther Marcellus Gowan and Mattie Magdalene Jacobs Gowan, was born October 20, 1912. She was graduated from Medina High School in 1930 and was married shortly afterward to Tommy Williams. She was later remarried to Harry Lenord Rickard. He died in 1951. In 1958 she removed to Washington. She died August 2, 1989 in Ken­newick, Washington and was buried in Hope Hill Cemetery. William Granville Gowan, son of William Henry Gowan and Judith Harriet Atkinson Gowan, was born September 20, 1815 in Madi­son County, according to the research of Forrest Bruce Gowan. He was mar­ried January 14, 1839 in Carroll County to Eveline Bruce Wood, ac­cording to Carroll County Mar­riage Book A. The groom was 24 and the bride 19. She was born November 22, 1819, according to her tombstone. Her son, James Edwin Gowan identified her as the daughter of John Wood and Sophia Wood. 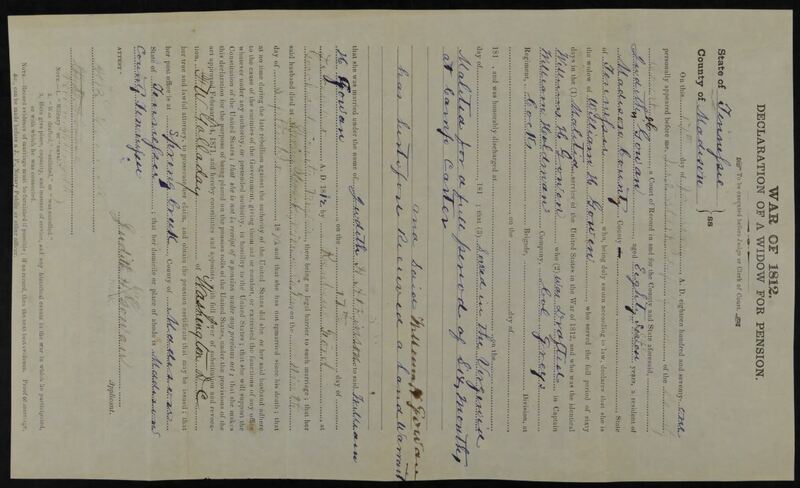 The will of William Granville Gowan dated January 11, 1896 is recorded in Carroll County Will Book, and it mentions “wife, E. B. Gowan.” He died April 11, 1905, and his will was pro­bated June 19, 1905. She died August 29, 1908. They were buried in Pleasant Hill Cemetery in Carroll County. James Edwin Gowan, son of William Granville Gowan and Eve­line Bruce Wood Gowan, was born in Madison County October 31, 1836, according to an interview he gave about 1892 for “Portrait and Biographical Review.” A “white male, under 5” appeared in his father’s household in the census of 1840 of Madison County. He ap­peared as a nine-year-old [13?] 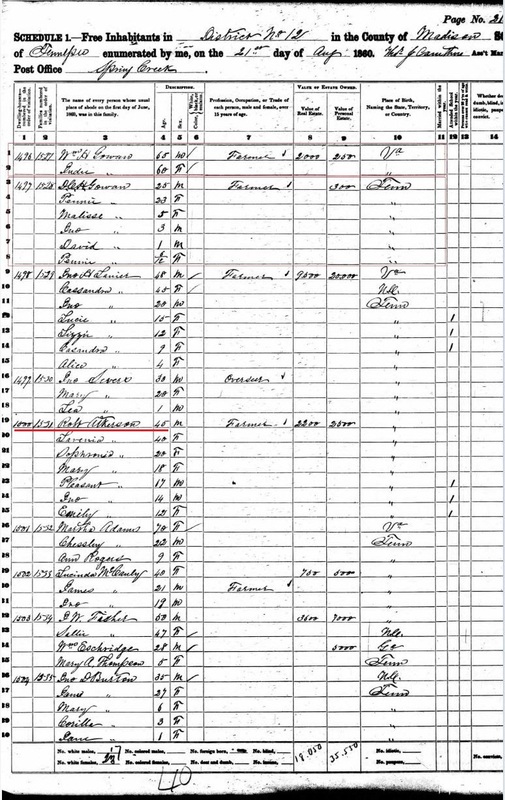 in the 1850 census of Carroll County living in his father’s household. “He received his early education in the subscription schools and afterward attended Jackson Academy at Jackson, Tennessee. In 1847, he entered McKendree College and graduated in the class of 1849 after which he began the study of medicine with Dr. Branick of Jackson.” In was graduated from Ohio Medical College in Cincinnati, Ohio and commenced practicing medicine at Metropolis, Illinois. He was married in 1863 to Harriett Yates, daughter of John Yates and Elizabeth Wallbright Yates. She was born in Ohio. She is also identified as the step-daughter of Mike Wilkins of Massac County. James Edwin Gowan died in 1893 at age 57. William Morris Gowan confirmed that James Edwin Gowan was a doctor. Michael Reed Gordon of Groton, Massachusetts called November 29, 1995 to report that he was a descendant of James Edwin Gowan. He stated that James Edwin Gowan was remarried to Lillian Jamison and had a daughter, Amy Gowan who was born about 1890. He also advised that James Edwin Gowan [or his son James Edwin Gowan, Jr.] responded to the gospel call at the end of his life. As he stepped into the river to be baptized, he fell into a whirlpool and was never seen again. Evaline E. Gowan, daughter of James Edwin Gowan and Har­riett Yates Gowan, a namesake of her grandmother, Eveline Bruce Wood Gowan, was born in 1865 in Massac County. About 1885, she was married, husband’s name unknown, and to this union four children were born. John G. Gowan, son of James Edwin Gowan and Harriett Yates Gowan, was born in 1867 in Massac County. He ap­peared in the 1880 census of Massac County as a 13-year-old living in the household of his father. He was married about 1888 to Lillian V. Jameson, daughter of Joseph D. Jameson and Jennie O’Melverny Jameson. Amy Gowan, daughter of John G. Gowan and Lillian V. Jameson Gowan, was born about 1890. John Edward Gowan, regarded as the son of John G. Gowan and Lillian V. Jameson Gowan, was born October 7, 1891. His death was recorded on the same day, according to the bible of Joseph D. Jameson. Harriet Aline Gowan, daughter of John G. Gowan and Lillian Jameson Gowan, was born about 1895. She was married about 1910 to James Finley Reed, son of James Reed and Hanna Shepard Reed. James Reed was a conductor on the CBQ Railroad until his retirement and then became a constable for the area. Hanna Shepard Reed was the daughter of Jim Shepard and Pheobe Malterny Shepard. Margret Reed, daughter of James F. Reed and Alice Gowan Reed, was born about 1918. She was married about 1931 to Ed Kalbercamp. In 1996 Margret Reed Kalbercamp Gillum and her daughter, Judie Kalbercamp Robbins lived in Albuquerque, New Mexico. They have retained the Gowan family bible “which had a number of newspaper clippings in it,” according to a letter written December 27, 1995 by Roy C. Gordon of Kennebunk, Maine, father of Michael Reed Gordon. Judy Kalbercamp, daughter of F. J. Kalbercamp and Margret Reed Kalbercamp, was born in 1943. She was married about 1969 to Sonny Robbins. In 1996 she continued in Albuquerque. Jimmie Joan Reed, daughter of James F. Reed and Alice Gowan Reed, was born about 1920. She was married about 1946 to Roy C. Gordon. Steven Reed Gordon, son of Roy C. Gordon and Jimmie Joan Reed Gordon, was born in 1949. He was married about 1972 to Ruthie Hall. Michael Reed Gordon, son of Roy C. Gordon and Jimmie Joan Reed Gordon, was born in 1950. In 1995 he was living in Groton, Massachusetts where he, a Foundation member, was active in the research of his Gowan family. David Edward Gordon, son of Roy C. Gordon and Jimmie Joan Reed Gordon, was born in 1960. He was married in 1990 to Lisa Campbell. John “Jack” Reed, son of James Finley Reed and Aleene Gowan Reed, was born about 1922. He was regarded as “reincarnation of his great-uncle Charles Gowan because of his uncanny resemblance to him,” according to Roy C. Gordon. Both had very dark hair and very light skin color. In 1996, John “Jack” Reed lived in Omaha, Nebraska. Julia Gowan, daughter of John G. Gowan and Lillian Jameson Gowan, was born about 1898. She was married about 1918 to Ed Kessell and lived in Centralia, Illinois. No children were born to them. Anna Gowan, daughter of James Edwin Gowan and Harriett Yates Gowan, was born in 1870 in Massac County. 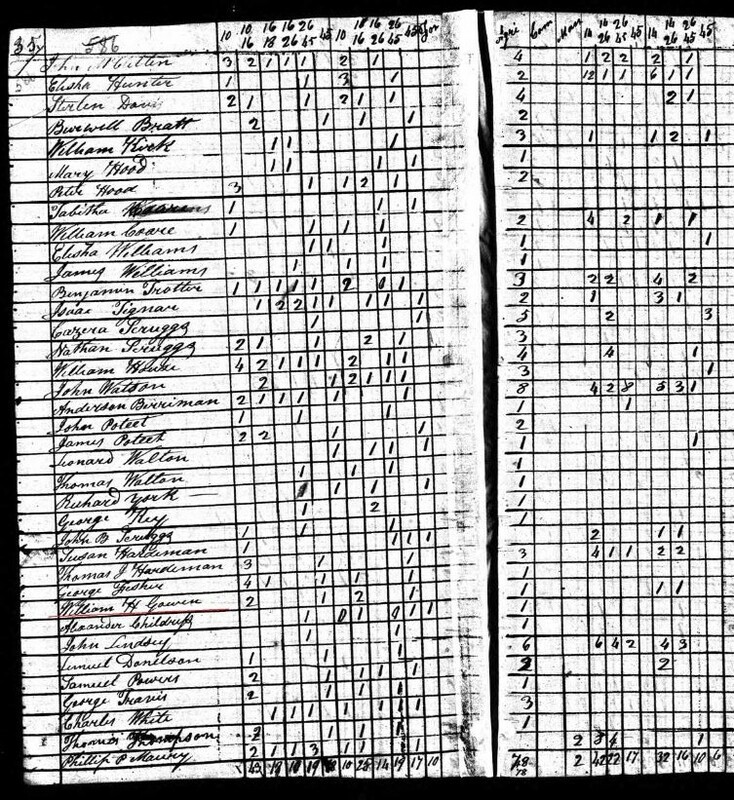 Anna Gowan ap­peared in the 1880 census of Massac County as a 10-year-old liv­ing in her father’s household. She was married first to Ed Corlis. Upon his death, Anna Gowan Corlis was married to L. G. Simmons. Minnonetta “Nettie” Gowan, daughter of James Edwin Gowan and Harri­ett Yates Gowan, was born in 1872 in Massac County. She ap­peared in the 1880 census as an eight-year-old living in the household of her father. James Edwin Gowan, Jr, son of James Edwin Gowan and Harriett Yates Gowan, was born in 1876. He appeared as a four-year-old in the 1880 census of his father’s household. Of this individual nothing more is known. He may have been the individual who stepped into the baptismal whirlpool and drowned in 1893. Louise Gowan Fisher, Box 387, Memphis, TX, 79245. Gerald F. Scott, Jr, 1924 Greene 912 Road, Paragould, AR, 72450. Mary F. Gowan, daughter of William Granville Gowan and Eveline Bruce Wood Gowan, was born in 1844 in Carroll County. She ap­peared in the 1850 census of Carroll County as a six-year-old liv­ing in the household of her father. She was married December 14, 1865 to J. C. C. Thompson, ac­cording to Car­roll County Marriage records. Flavius M. Gowan, son of William Granville Gowan and Eve­line Bruce Wood Gowan, was born in 1845 in Carroll County. He ap­peared in the 1850 census as a five-year-old living in his father’s household. In the 1880 census of Craighead County, Arkansas, Powell Township, Household No. 223-2232 enumerated on June 20, 1880 appeared the household of “Flavious Gowen,” believed to be Flavius M. Gowan. At that time he stated that he was born in Tennessee and that both of his parents were born in Virginia. 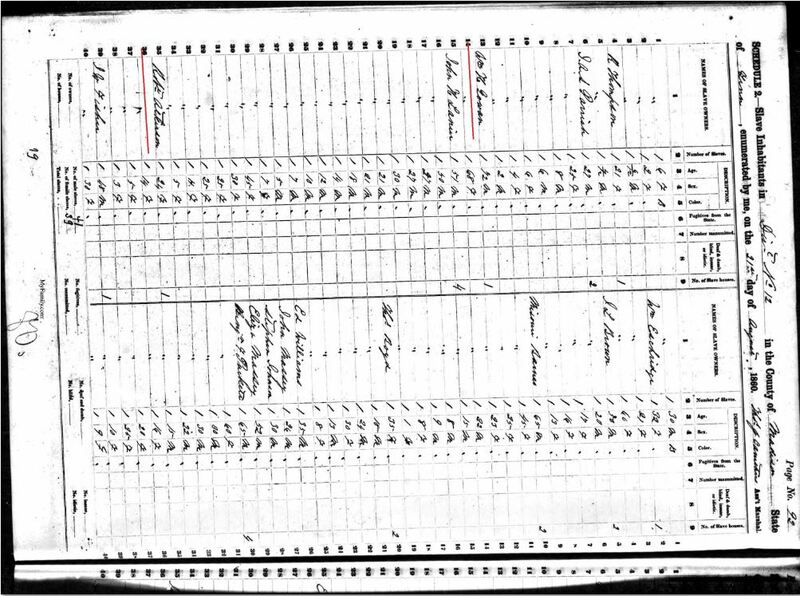 Flavius M. Gowan did not appear in the 1870 census of Craig­head County. Pleasant H. Gowan, son of William Granville Gowan and Eve­line Bruce Wood Gowan, was born in 1849 in Carroll County. He ap­peared as a one-year-old in the 1850 census of Carroll County living in the household of his father. Martha E. Gowan, daughter of William Granville Gowan and Eveline Bruce Wood Gowan, was born in 1852. She was mar­ried November 12, 1868 to George H. Martin, according to Carroll County marriage records. George H. Gowan, son of William Granville Gowan and Eve­line Bruce Wood Gowan, was born January 29, 1854. He was married about 1873 to his first cousin-once removed, Louisa Jane “Lou” Gowan. She was born August 10, 1851 to Bill Gowan and Dicey Ledbetter Gowan. George H. Gowan died in 1920 and was buried in Pleasant Hill Cemetery in Carroll County. It was recorded in family records that Louisa Jane Gowan Gowan was 82 on August 10, 1933. Louisa J. “Lue” Gowan Gowan died November 18, 1958 and lived to be 107, according to Forrest Bruce Gowan. She was buried beside her husband in Pleasant Hill Cemetery. Lucy S. Gowan [Dicy L. ?] Gowan, daughter of George H. Gowan and Louisa J. Gowan Gowan, was born about 1876. She was born about 1899 to Granville Warren. No children were born to them. Harriet E. Gowan, daughter of George H. Gowan and Louisa J. Gowan Gowan, was born about 1878. Sallie D. Gowan, daughter of George H. Gowan and Louisa J. Gowan Gowan, was born about 1879. Dicey Harriett Gowan, daughter of George H. Gowan and Louisa J. Gowan Gowan, was born about 1881. Gertrude Gowan, daughter of George H. Gowan and Louisa J. Gowan Gowan, was born about 1883. She was married about 1900 to Elmo McAlexander, perhaps a brother to Will McAlexander. William Oscar Gowan, son of George H. Gowan and Louisa J. Gowan Gowan, was born October 17, 1884. He was married twice, according to Forrest Bruce Gowan. He was married about 1907 to Myrtle E. Barger. She was born September 12, 1877 and died October 23, 1919. She was buried in Pleasant Hill Cemetery in Carroll County. It is believed that he was married second about 1920, wife’s name Gladys May. William Oscar Gowan died July 12, 1932 and was buried beside Myrtle E. Gowan. Myrtle Gowan, daughter of George H. Gowan and Louisa J. Gowan Gowan, was born about 1886. She was married about 1905 to Sam McAlexander, perhaps a brother to Will McAlexander. Etta Gowan, daughter of George H. Gowan and Louisa J. Gowan Gowan, was born January 8, 1891. She was married about 1907 to Joe Warren. She died June 25, 1950 and was buried in Pleasant Hill Cemetery. Horace [Harris?] Gowan, son of George H. Gowan and Louisa J. Gowan Gowan, was born about 1894. He removed to Arkansas. Freda Gowan, daughter of George H. Gowan and Louisa J. Gowan Gowan, was born about 1897. Ada Gowan, daughter of George H. Gowan and Louisa J. Gowan Gowan, was born about 1901. She was married about 1920 to Elmo McAlexander, perhaps a brother to Will McAlexander. Hattie Gowan, daughter of George H. Gowan and Louisa J. Gowan Gowan, was born about 1903. She was married about 1919 to Will McAlexander. Sarah Virginia Gowan, daughter of William Granville Gowan and Eveline Bruce Wood Gowan, was born April 4, 1856 in Carroll County. She was married to her cousin, John Milton Gowan. For details of their life, see his section. Granville Luther Gowan, son of William Granville Gowan and Eveline Bruce Wood Gowan, was born January 2, 1859, proba­bly in Carroll County. He appeared as a 20-year-old living in the house­hold of his fa­ther in the 1880 census of Carroll County. He was married about 1882 to Norma Clark. He was remarried about 1883 to Alice Hopper who was born May 2, 1859. No children were born to Norma Clark Gowan. In 1943 he was living in Bemis. Granville Luther Gowan died March 8, 1949 and was buried in Pleasant Hill Cemetery in Carroll County. Alice Hopper Gowan died January 26, 1946 and was buried beside her husband. Granville Elmer Gowan, son of Granville Luther Gowan and Alice Hopper Gowan, was born December 31, 1883 at Cedar Grove, Tennessee. He was married October 3, 1909 in Corinth, Mississippi to Nellie Grace Epps. She was born September 9, 1886 to John Allen Epps and Mary Elizabeth Hunt Epps. Granville Elmer Gowan died October 6, 1958 and was buried in Hollywood Cemetery at Jackson. Nellie Grace Epps Gowan died August 22, 1981 and was buried be­side her husband. Pansy May Gowan, daughter of Granville Elmer Gowan and Nellie Grace Epps Gowan, was born October 3, 1910 in Jack­son. In 1981 she lived in Jackson unmarried. Granville Elmer Gowan, Jr, son of Granville Elmer Gowan and Nellie Grace Epps Gowan, was born July 30, 1912 at Alamo, Tennessee. In 1981 he lived at Jackson. Pattie Maurice Gowan, daughter of Granville Elmer Gowan and Nellie Grace Epps Gowan, was born November 23, 1914 at Alamo. She was married in 1937 to U. S. Murray. In 1981 they lived at Jackson. G. Allen Murray, son of U. S. Murray and Pattie Maurice Gowan was born at Jackson about 1939. He became a physi­cian and was practicing at Memphis in 1981. Nelda Grace Gowan, daughter of Granville Elmer Gowan and Nellie Grace Epps Gowan, was born September 8, 1918 at Alamo. She was married in 1940 to C. Bowman. She died June 1, 1956. Otis Marcellus Gowan, son of Luther Granville Gowan, was born in 1899. He died in 1965 and was buried in Pleasant Hill Cemetery. Harris M. Gowan, son of William Granville Gowan and Eve­line Bruce Wood Gowan, was born about 1862, probably in Carroll County. Of this individual nothing more is known. Archibald Beauregard Gowan, son of William Henry Gowan and Judith Harriet Atkinson Gowan was born May 8, 1818 in Tennessee, according to Forrest Bruce Gowan. Of this indi­vidual nothing more is known. David Crawford Harris Gowan, son of William Henry Gow­an and Judith Harriet Atkinson Gowan was born September 4, 1821 in Tennessee. He was married October 26, 1854 to Priscilla H. “Penny” Fuller, according to “Carroll County, Ten­nessee Marriages, 1838-1859.” Children born to David C. H. Gowan and Priscilla H. Fuller Gowan are un­known. Pleasant Andrew Gowan, son of William Henry Gowan and Ju­dith Harriet Atkinson Gowan, was born August 29, 1822 near Jackson. He was married July 30, 1849 to Mary A. Eliz­abeth “Emma” Harris, according to Gerald F. Scott, Jr, a de­scendant of Paragould, Arkansas. John L. Brown was a wit­ness to the ceremony. Mary A. Elizabeth “Emma” Harris was born in Vir­ginia August 1, 1827. The District of Columbia was surveyed in 1791 and dedicated in 1800 with land from Fairfax County, Virginia and Prince George County, Maryland. Pleasant Andrew Gowan received land grant No. 16772 for 19 acres in adjoining Henderson County, Ten­nessee Febru­ary 1, 1883, according to Tennessee State Land Office records. Landon R[oss?] Gowan, son of Pleasant Andrew Gowan and Mary A. Elizabeth “Emma” Harris Gowan, was born July 7, 1850. He was married about 1875, wife’s name, Mary A. An earlier “Landon S. Gowing” appeared in nearby Amelia County, Virginia. He appeared in the marriage records there when three of his daughters were married between 1828 and 1833. Landon R. Gowan, a farmer, died June 21, 1919, at age 68 in Madison County of pernicious anemia, according to Ten­nessee BVS Death Certificate No. 48812, signed by F. L. Keil, M.D. of Lavinia, Tennessee. He was buried in Lebanon Cemetery, ac­cording to his son, Marvin Gowan of Medina, Tennessee, in­formant. William B. Gowan, son of Landon R. Gowan and Mary A. Gowan, was born about 1876. He appeared as a four-year-old in the 1880 census of his father’s household. Horace Ross Gowan, son of Landon R. Gowan and Mary A. Gowan, was born about 1878 in Tennessee. He appeared as a two-year-old in the 1880 census of his father’s household. On August 27, 1911 he was married to Mineola “Minnie” Green [perhaps a cousin] at Jacks­boro, Texas, ac­cording to the Jack County, Texas Marriage Book 6. page 47. Mineola “Minnie” Green was born in Jack County in 1888. Horace Ross Gowan received a deed to lots in Block 19, Es­telline, Texas from R. L. Bailey September 1, 1911, according to Hall County Deed Book 68. page 249. Horace Ross Gowan died about 1917 and Mineola “Minnie” Green Gowan was appointed administratrix of the estate, ac­cording to Hall, County Probate Book 4, page 187. Mineola “Minnie” Green Gowan, “femme sole of Hall County” re­ceived a deed from J. H. Bauman to lots in Block 9, in Es­telline, Texas November 12, 1918, according to Hall County Deed Book 32, page 492. Mineola “Minnie” Green Gowan was remarried to T. N. Copeland January 12, 1922, according to Hall County Mar­riage Book 3, page 48. The couple moved to Jack County. Later by 1931, they had returned to Estelline. Mineola “Minnie” Green Gowan Copeland died in Jack County De­cember 19, 1970, ac­cording to Jack County death records. Monna Delza Gowan, daughter of Horace Ross Gowan and Mi­neola “Minnie” Green Gowan, was born August 7, 1912 at Es­telline. She appeared as a nine-year-old in the pro­bate records of her father in 1921, according to Hall County Pro­bate Book 3, page 3 and Book 4, page 187. In 1931 she was listed as a freshman liberal arts student from Estelline at Texas Technological College, Lubbock, Texas. She listed her mother as Mrs. T. N. Copeland, Box 67, Es­telline at that time. Monna Delza Gowan was married to Jack S. Raines, age 24, of Estelline November 24, 1932 at Hollis, Oklahoma, ac­cording to Harmon County, Oklahoma Marriage Book 8, page 559. Horace Ross Gowan, Jr, son of Horace Ross Gowan and Mine­ola “Minnie” Green Gowan, was born May 24, 1914 at Jacks­boro. He was graduated from Texas A&M College in the class of 1939 with a B.S. degree in petroleum engin­eering. At that time he gave his residence as 215 Belknap Street, Jacks­boro. He enlisted in the U. S. Army from that address February 15, 1941 and became a major in the 141st Coast Artillery. Dur­ing World War II he served in the Battles of Luzon and Northern Solomons and was overseas from October 6, 1942 until Novem­ber 8, 1945. When discharged April 7, 1946 he stated that he was a petroleum engineer for Texas Company. He was married September 21, 1946 to Ima Jean Edwards, ac­cording to Jack County Marriage Book 10, page 121. The wed­ding was performed in the First Christian Church at Denton, Texas. Horace Ross Gowan, Jr. and Ima Jean Edwards Gowan owned a ranch and dealt in oil ad gas minerals in Jack County. On Oc­tober 24, 1956 they contracted with Coke L. Gage on a lease of 200 acres, land, according to Jack County Deed Book 214, page 429. Horace Ross Gowan, Jr. suffered a heart attack on his ranch 15 miles south of Jacksboro on July 4, 1968 and died there, accord­ing to Jack County Death Book 5, page 162. He was buried in Oakwood Cemetery at Jacksboro. His residence at the time of his death was listed as 1111 West Thompson, Jacks­boro. Ima Jean Edwards Gowan became the administrator of the es­tate of Mineola “Minnie” Green Gowan Copeland in 1970 and 1971. In 1973 she continued to live in Jacksboro at 1111 West Thompson. Mary Martha Gowan, daughter of Horace Ross Gowan, Jr. and Ima Jean Edwards Gowan, was born November 16, 1950, at Jacksboro according to BVS File 172006. In February 1971 she was represented by her mother in the set­tlement of the estate of her grandmother, Mineola “Minnie” Green Gowan Copeland. In 1971 she was a junior student at West Texas State University, Lynette Apartments, Canyon, Texas, according to the student directory. James Don Gowan, son of Horace Ross Gowan, Jr. and Ima Jean Edwards Gowan, was born December 30, 1952 at Jacks­boro, according to Jack County Birth Book 6, page 422. On February 8, 1971 he signed an agreement with his mother regarding his father’s estate, according to Jack County Deed Book 679. On April 6, 1971 he gave a warranty deed to An­nie L. Dixson, believed to be a relative of his father, accord­ing to Jack County Deed Book 327, page 191. In 1972 he was listed as a freshman at Texas Tech University and showed his perma­nent residence with Lester Phillips, 1111 West Thomp­son, Jacksboro. On September 8, 1973 he gave an easement to Southwestern Gas Pipe Line Company, according to Jack County Deed Book 380, page 864. Helen Gowan, daughter of Landon R. Gowan and Mary A. Gowan, was born in January 1880. She was married about 1895 to Thomas Grace, believed to be the son of Mrs. Martha Grace who was married to her father as his second wife. The family of Thomas Grace and Helen Gowan Grace was enumerated in the household of Landon R. Gowan in the 1900 census. Charles Ernest Gowan, son of Landon R. Gowan and Mary A. Gowan, was born December 30, 1882. On January 2, 1912 he received a deed from J. E. King for land in Hall County, Texas, according to Hall County Deed Book 24, page 526. This land was awarded to H. G. Stephens by the Texas Land Commission at $2 per acre originally. Charles Ernest Gowan paid $5,200 for the tract. On January 13, 1917 Charles Ernest Gowan received a patent from the State of Texas to 160 acres of land located on the In­dian Creek tributary of Red River, according to Hall County Patent Book 1, page 488. He was shown as an assignee of H. G. Stephens in the transaction. On September 8, 1923 Charles Ernest Gowan received a deed from Mrs. Alice W. Richardson and the T. A. Richardson estate to 2.5 acres located on the out­skirts af Memphis, Texas for $500, according to Hall County Deed Book 44, page 516 and Deed Book 46, page 45. On February 12, 1924 he purchased land from S. F. Laughlin for $1,400, according to Hall County Deed Book 47, page 15. On April 2, 1934 he received a deed from J. M. Elliott, accord­ing to Hall County Deed Book 63, page 625. Charles Ernest Gowan was married to Nannie Ola McElreath about 1910. She was born in Grayson County, Texas in 1891. Charles Ernest Gowan was declared non compus mentis by the Probate Court of Hall County December 27, 1950, according to Probate Court Book 16, page 66. His estate, valued at $12.925, was placed under the administration of Nannie Ola McElreath Gowan. Nannie Ola McElreath Gowan, administratrix deeded land to her daughters, Dorothy Gowan and Louise Gowan Fisher May 22, 1953 for $8,000, according to Hall County Deed Book 103, page 268. Charles Ernest Gowan went to court January 15, 1954 and ob­tained a judgement to set aside the estate administration. The court judged him sane, according to Probate Book 16, page 179. He apparently regained control of his property because on May 31, 1955 he entered into an oil and gas lease with Sinclair Oil & Gas Company, according to Hall County Deed Book 108, page 509. Charles Ernest Gowan and Nannie Ola McElreath Gowan were divorced during this period. On December 19, 1956 Nannie Ola McElreath Gowan, a femme sole, deeded to Charles Ernest Gowan her interest in a ten‑acre plot in Memphis with resi­dence and in an 80-acre plot, according to Hall County Deed Book 109, page 248. At the same time Charles Ernest Gowan deeded to Nannie Ola McElreath Gowan, “an unmarried woman” his in­terest in 2.5 acres in Memphis and in an 80‑acre plot in the county, according to Hall County Deed Book 109, page 247. Charles Ernest Gowan, “an unmarried man” leased his 80 acres to K. C. Bates May 8, 1957 for oil and gas exploration, ac­cording to Hall County Deed Book 114, page 319. Charles Ernest Gowan died December 7, 1957 of a cerebral hemor­rhage, after a 40-year residence in Hall County at age 74. At the time of his death, he, a retired farmer, lived on West Main Street in Mem­phis. He was buried in Fairview Cemetery in Memphis. Two days later Nannie Ola McElreath Gowan received a deed from Charles Richard Gowan, her son, on December 9, 1957, according to Hall County Deed Book 112, page 463. Nannie Ola McElreath Gowan, his estranged widow, was again appointed administratrix of the estate by the court. The estate consisted of 80 acres of land in the county and a 10‑acre plot on the outskirts of Memphis. Nannie Ola McElreath Gowan continued to make her home in Memphis and in the March 1974 telephone directory continued to have a listing [259‑2383]. He was married about 1905, wife’s name unknown. He died in 1957, according to Louise Gowan Fisher, a daughter. Abbie Phoeby Gowan, first child of Charles Ernest Gowan and Nannie Ola McElreath Gowan, was born November 27, 1912, according to Hall County Delayed Birth Book B, page 51 and BVS File 39611. Her parents lived on a farm four miles south­west of Memphis at that time. She died January 25, 1926 at age 13, according to BVS File 1825. Nannie Margaret Gowan, second child of Charles Ernest Gowan and Nannie Ola McElreath Gowan, was born October 23, 1913, according to Hall County Delayed Birth Book 1, page 136. During World War II, she worked at Bluebonnett Ordinance Plant at McGregor, Texas. In 1951 she was married to Bernard Whitney of Clifton, Texas where they owned a jewelry store and a dress shop until his death in 1965. She then lived in Hillsboro, Texas for 14 years, working part of that time as a cashier at Thunderbird Restaurant. She was dorm director at Baylor University in Waco, Texas for several years following. In 1991 she became a resident at Stilwell Teacher’s Retirement Home in Waco before moving to Lutheran Sunset Home in Clifton where she died of cancer February 24, 1995 at the age of 81. Her funeral was conducted by Rev. Claus Rholfs of Waco and Rev. Brian Gowan, a nephew of Houston, and she was buried in Clifton Cemetery beside her husband. She was active in many volunteer activities, according to her obituary published in the February 26, 1995 edition of the “Waco Tribune-Herald.” She volunteered for Providence Hospital, Caritas and Meals on Wheels. She was a member of Central United Methodist Church in Waco where she held many offices for United Methodist Women. Mark Whitney, a step-son of Clifton and a sister, Louise Gowan Fisher, survived her. Dorothy Gowan, third child of Charles Ernest Gowan and Nan­nie Ola McElreath Gowan, was born January 10, 1914, accord­ing to Hall County Birth Book B, page 175. In 1957, at age 43, she remained single, living in Memphis. Charles Richard Gowan, fourth child of Charles Ernest Gowan and Nannie Ola McElreath Gowan, was born May 10, 1918, ac­cording to Hall County Delayed Birth Book 2, page 145. Charles Richard Gowan in 1837 was a freshman at Texas Tech­nological College living at 2017‑14th Street, according to the Lubbock, Texas city directory. In 1940 and 1941 he was listed as assistant manager of Penrod’s, according to the directory. In 1940 he lived at 1412 Main Street. and in 1941 he lived at 1608 Broad­way. He was married about 1946, wife’s name Una. She was a native of Ireland. In 1958 they were residents of Walla Walla, Wash­ington. He was deceased by June 1993, and she lived in Spokane, Washington. Four sons and two daughters, names unknown, were born to them. Louise Gowan, fifth child of Charles Ernest Gowan and Nannie Ola McElreath Gowan, was born December 30, 1922, according to Hall County Birth Book 4, page 38. Prior to 1953 she was married to Elmer Fisher and lived at Pampa, Texas. He died in December 1992, and Louise Gowan Fisher in June 1993 lived alone on a 400-acre ranch four miles west of Memphis. Chil­dren born to them are unknown. In 1930, at the age of seven, she was taken back to Jackson, Tennessee for a visit with her family members. In 1993, 63 years later, she returned to visit with her family members again and to gather genealogical information. She a member of Gowen Research Foundation is devoting time to developing the history of her branch of the Gowan family.